We are four weeks into our visit to West Sussex. News of the Olympics is everywhere, while Andy Murray’s Wimbledon disappointment has faded into memory. He cried. . . he should not have cried. . . no one cares now. That was yesterday. The Brits move from one perceived sporting disaster and one fallen hero to another. God help Luke Donald if he doesn’t win the British Open. Curses on the head of any British athlete who fails to win an Olympic medal. We read several British newspapers daily, and the headline on the front page is, invariably, “How will Britain do in ___ (fill in the blank)?” And every failure is trumpeted scornfully in the press. The British press seems to particularly enjoy its “Schadenfreude”. We are well settled into our West Sussex house in the woods, with only a week till we move on to our northward trek to visit our friends Sally and Jack McGill in Norwich. Despite the three months of almost nonstop rain England had experienced this summer, our four weeks here have been wonderful, with lazy days of lounging, reading and TV-watching, punctuated by trips to the Tesco Superstore in Horsham or the shops in nearby Billingshurst. Dinners are as often cooked at home on the Aga as eating out. Weather permitting, we go to one of the many National Trust properties in the vicinity and have visited beautiful gardens and impressive country homes. We always try to have lunch at one of the “Top Pubs of England” during these trips, and have never been disappointed. Food at gastropubs has only gotten better since we were last here in 2010. 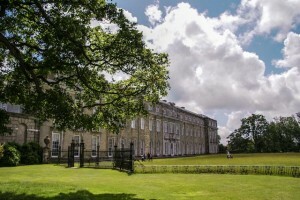 Our day trips have included a visit to Petworth House, one of the homes of the great Percy family — the Earls of Northumberland — during the 17th century. 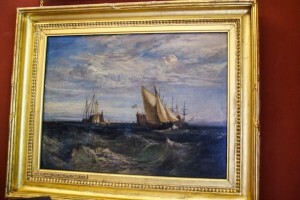 The house is full of magnificent paintings and sculptures, including two dozen or so works by Turner, who was given a studio in the house by his noble patron. We’d been to Petworth during a previous trip, but on a rainy day the interior of the house is too dark to allow visitors to see the paintings very well. So this time we waited for a sunny day (there have been a few of those) and had a great experience. Petworth also is home to an original copy of Chaucer’s Canterbury Tales, displayed in a glass cabinet in the middle of a room, open to the Prioress’ Tale. Nymans, another nearby National Trust property, was the home of Anthony Armstrong-Jones’ (Lord Snowdon’s) mother and had the most incredible rose garden we’ve ever seen. The house itself is intriguing. It was built on the bones of a very plain Georgian house in the early 20th century in neo-Gothic style, so it looks a lot older than it is. A disastrous fire in 1960 gutted the main part of the house, including the Great Hall, leaving very romantic-looking ruins, which were not touched except to remove debris. The 1690 country house Uppark has an interesting, if chequered past: The last remaining male heir to the place had as his mistress at one time Emma Hart, who later became Lady Hamilton and was the longtime mistress of Lord Nelson. At one of the lavish house parties, she danced naked on the dining room table. That same heir married for the first time — at the age of 72 — his 20-year-old dairymaid and left Uppark to her on his death. And H.G. Wells’ mother was the housekeeper there in the late 19th century. It was raining when we went to Uppark, and we weren’t allowed to take pictures in the house, so all we can do is tell you that it is very beautiful, especially considering the fact that a disastrous fire in the 1980’s, caused while repairs were being made to the roof, destroyed much of the interior. Firemen rescued most of the furniture and paintings, but structural damage was severe. One of the chimneys fell through three floors of the main house and ended up in the basement. Restoration took five years, but the results are amazing. We briefly visited Wakehurst Place, the garden allied with the famous Kew Gardens in London, and were impressed with the variety of trees found there. Giant sequoias stand guard along the paths, as well as many blooming trees we were unfamiliar with. 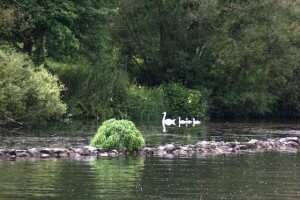 Wakehurst also has a water garden, complete with ducks and swans, and a carefully designed rock garden. 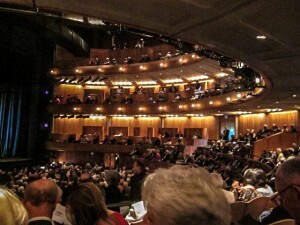 We spent a very enjoyable evening at the opera at Glyndebourne, where we saw a superb production of Rossini’s La Cenerentola and had a terrific English country house opera experience: drinks in the Long Bar, then the opera starts at 5:20, breaks after the first act for dinner, either in the Prue Leith restaurant or a picnic on the lovely grounds. The performance resumes after 90 minutes, and ends in time for the London train at 10:00. Very civilized. The opera was just great, with wonderful voices, talented singing actors, beautiful costumes, creative sets, and a fine orchestra in the pit. 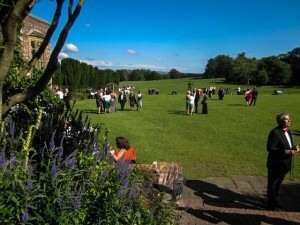 It had been several years since we were last at Glyndebourne, but we were reminded again of why it is considered one of the world’s best opera companies. We stayed overnight after the opera at another beautiful country house hotel, Horsted Place, about two miles from the opera house. The family that formerly owned Horsted Place were close friends of Queen Elizabeth and Prince Philip, who used to spend weekends there with their family when the royal children were young. The house is beautiful and comfortable, and it must have been a pleasure for the Queen to be able to relax with friends and family for a few days out of the public eye. Last weekend we went to a matinee performance of Shaw’s play Heartbreak House at Chicester Festival Theater, featuring Derek Jacobi. Our seats gave us a great view of the stage, but we weren’t impressed with the theater’s acoustics. We missed about 80% of the dialogue (except during a torrential downpour that drummed on the roof for ten minutes, when we missed 100%). If you can’t hear the dialogue in a Shaw play, you might as well be sitting there watching paint dry. This week features a dinner at The Blue Ship, our local pub, where we will host the entire staff who cared for our needs here at Keeper’s Cottage. Amanda, our majordomo, whom we drove crazy with problems early in our stay and who takes care of us while running the Woodland Skills program; Clive, the woodlands manager; Darren, the gardener; and Yanina, the housekeeper, a Bulgarian beauty. Beyond all that, we will go into London on the train to spend the day buying Olympic gear for the family as souvenirs, as John Lewis department store is the only official purveyor of official clothing for the Olympics, and Lillywhites has all the football (soccer, to us) gear for every Premier League team. If possible, while we’re in London we hope to get tickets to the matinee performance of the play War Horse, which has been sold out for weeks. Occasionally, some tickets are turned back in to the box office, so we’ll drop by the theater before the show and try our luck. Nothing lost, since we’ll be in town anyway. And then on Saturday, we take the train to Ascot, where — all dressed up, LKS in her new hat, and GLS in blazer and tie — we’ll watch the King George VI and Queen Elizabeth stakes. We’ve seen all the favorites run in other races, either in person or on TV, so this will be a great racing day. We’ll catch up with you in Norwich next week. Sometimes the best way to capture the flavor of a place is to recount several seemingly unrelated incidents that eventually add up to a complete picture. So, in no particular order, here are some of our observations about Sussex. Shortly after we arrived at Keeper’s Cottage, we drove into Billingshurst to take care of a couple of essentials. After almost a month away from home, Gerry was in serious need of a haircut, so he went to the barber shop on the High Street that had been recommended by Clive (the woodsman at the cottage). The price listed on the sign was £9.50, which seemed pretty reasonable — about $15.00. But afterward, when he was presented with the bill, it was £6.50. Gerry is aware that he doesn’t have as much hair to cut as he used to, but he was puzzled and asked why the price was so much less. “You get the OAP price” was the answer — “Old Age Pensioner,” the British term for a senior citizen. After we met Pom Oliver, the owner of Keeper’s Cottage, she invited us to come to dinner that Saturday at The Barn, the home base for her Woodland Skills program, which is about a hundred yards away as the crow flies, but a quarter mile by road. Since it’s pretty muddy out here once you step off the deck, we drove. Pom’s husband, Kent, was there, along with Clive the woodsman and Pom’s ward, a pretty young Chinese girl named Qiao, and her boyfriend, Dwayne, also Chinese. The young people go to school nearby, and Pom is acting as Qiao’s guardian while she’s in the UK. Kent is a charming, intelligent man — also a film producer, like his wife — and a terrific dinner companion. He is looking into exporting wine to China, which sounds like a very interesting business proposition, and he asked us to give our opinions about some of the wines he was considering. So we had a mini-tasting while Dwayne prepared the dinner (I think he hopes to have his own restaurant one day). Pom and Kent are now working on a documentary about the famous Flying Tigers of World War II, which may explain some of their current interest in China. It was a lovely, warm, relaxing evening, and we were reminded of how hospitable and friendly the English are toward strangers. 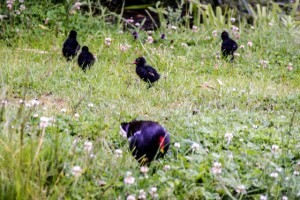 We have a family of moorhens by the lily pond — mother, father, and four round, fluffy black chicks that look like ping pong balls on legs. I’ve only seen the chicks once, very early one morning when I came up to the kitchen to make coffee and surprised the entire family having breakfast in the short grass off the deck. The rest of that day, one or another of the parents periodically came close to the house and yelled at me whenever I made an appearance, warning me to stay away from the babies. Moorhens are extremely protective of their young, we’re told, so I didn’t argue the point. 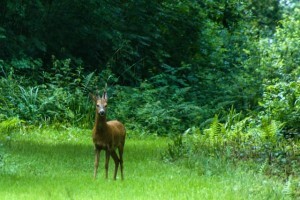 There are brown bunnies and small brown deer in the woods, perhaps roe deer, and we see them from time to time, although never up close. One of the does has twin fawns, but we’ve only seen the adults. A few days ago, Gerry came rushing into the little study where I was working on the computer, almost too excited to speak: he’d just seen a fox on the mowed path through the woods. At first, he thought it might be a dog, but then he saw the long, red, bushy tail. Foxes aren’t very popular with the locals, I suppose, but we city folk are thrilled when we have the chance to see one. Coming back from buying a newspaper at the nearest filling station a few days ago, Gerry had a confrontation with two young male pheasants who were walking down the middle of our lane. They were determined to continue on their chosen path; and as Gerry drove very slowly up to them, they fluttered up into the air with a great beating of wings, flew ahead a couple of yards, and settled back down onto the lane in front of him. Only when he actually bumped them gently with the car did they move off to the side of the road, probably muttering, “Big bully!” as they went. When we were driving down the lane yesterday, coming home from the market, we saw two unusually-marked finches on the fence. One flew up into the trees, but the other sat and looked at us for as long as I left the engine off. Its light tan body, white rump, black and yellow wings, and black and white head with a bright red head scarf were so distinctive that we were sure the bird book in the cottage would identify it, and we were right. It was a European goldfinch, not found in America, and it was spectacular. One thing we learned the first time we rented a cottage here is that English houses, especially old ones, never have screens on their windows and doors. Part of the reason is that the windows typically open out and are held in place by long rods at the bottom that hook over latches on the window sill. But mostly I think it’s just a matter of tradition. So in the summer, when we open the windows to let in the lovely soft air, we also invite in whatever flying insects might be in the neighborhood, mainly very large, fat flies with a very brief life span. So every morning, the stone floors are littered with tiny corpses, which Gerry sweeps up with a whisk broom and dustpan and deposits outside. We can always tell we’re in an English market as soon as we get to the produce department. British strawberries and raspberries are in season now, and are selling at half price in many of the shops. Beautiful leeks and small heads of cauliflower; fat pods of English peas; baby corn and broccolini and tender French green beans; a dozen different kinds of new potatoes; sweet bell peppers and fresh greens and cabbage and tiny crisp heads of lettuce — I could just pull up a chair and spend the day in one of the produce aisles. There are some things you can’t get here, like tender, flavorful cuts of beef or most seafood (except for very expensive scallops and equally expensive — and small — shrimp), but we work around that. The British still haven’t discovered how to make plastic trash bags that don’t shred on the way out of the garbage can, or paper towels bigger than a Kleenex, or zip-locking plastic storage bags, or decent dish sponges, or any kind of plastic food container. On the other hand, you can buy very good ground coffee now — everyone uses a French press coffee maker — instead of the instant coffee that was all we could find when we first started coming to England more than twenty years ago. And no one makes double cream like the British — you can stand a spoon up in it, and it’s delicious. It’s rained at least a little nearly every day since we arrived, as those of you who watched Wimbledon will know, but we really don’t mind the rain. The peonies have finished blooming now, but the yellow roses are very hardy and are putting on quite a display, rain or shine. Wherever we go, the locals apologize for the weather, as though they were personally responsible for making the sun shine for us. We went to the Blue Ship, our local pub, for dinner ther other night in the pouring rain; and as we blew in through the front door, a table of local residents having drinks in the bar cheered our temerity. People are beginning to recognize us now: the cashiers at Budgens, the grocery store in the village; the clerk in the wine shop; the owner and his wife at the Blue Ship (she gives us a big hug now when we come in for dinner); the woman who owns the little bakery and sells decadent sweet rolls as well as wonderful sandwiches; the young man who has the unenviable job of policing the car park that has only recently begun charging for parking, so he has to put up with a whole lot of vitriol from the locals; the guy at the till at Martin’s, the local newsagent, where we buy our daily papers. This is just the way we like to spend our time in England, doing everything at a leisurely pace, so we can immerse ourselves in life here and feel less like tourists and more like semi-regular visitors. With so much beauty around us, we need time to absorb it all. Even a lifetime wouldn’t be long enough. For those of you who have been following my Tauck riverboat posts, I haven’t finished them yet, although I can see the finish line. If you’ve had trouble finding them, it may be because I date them as of the date when we were actually in that city or at that location, rather than the date I post them on the web site. The easiest way to find them is to go to our “Home” page and scroll down until you see the categories listed on the right side of the page. Click on “Travel,” and only posts with that designation will come up. Then scroll down through the posts until you come to the ones with the names of the cities we visited on the river cruise. The more recent ones will be nearest the top, the older ones below (last to first, in reverse order). 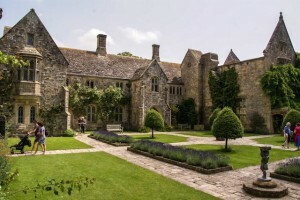 In my last post, you may remember I mentioned that our rental car died once or twice before we got to Gravetye Manor, a glitch I attributed to my unfamiliarity with (a) driving an Audi in general, and (b) driving a diesel Audi in particular. But a nightmare trip from Haywards Heath on the (naturally under construction) A272 — 30 minutes of stop-and-go driving, with the engine cutting out every time I stopped — convinced both of us that something was dangerously wrong with that car. Once we finally, and very thankfully, pulled up in front of our home for the next five weeks, we’d decided to tell Alamo to come and get the Audi and bring us something that actually ran. But all our frustration evaporated at the first sight — and scent — of Keepers Cottage. When we walked in the door, we were greeted by huge bouquets of flowers in every room, mainly giant pink peonies, all freshly cut from the gardens that surround the house. 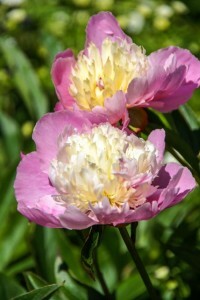 The fragrance of peonies has permeated the entire house, lasting for days. Originally the gamekeeper’s cottage for the large estate of which this property was once a part, the house has been sympathetically restored and enlarged by its present owner (more about her later). The period cottage was built in the mid-nineteenth century and is thus quite a lot newer than the places we’ve rented on our previous visits to England. But the agent with whom we’ve dealt for twenty years has never once steered us wrong, so when he said he thought we would love the house even though it is different from the ones we’ve lived in before, we trusted his judgment. And we are very glad we did. When the owner bought the property and its surrounding sixty-three acres, the cottage was virtually in ruins, with no roof and no discernable charm. But the woodland setting was, even then, incomparable, and someone with vision and style could see the potential in the bones of this small house.Now, surrounded by a stone wall enclosing the most beautiful flower garden of any house we’ve rented, the cottage is a delight. 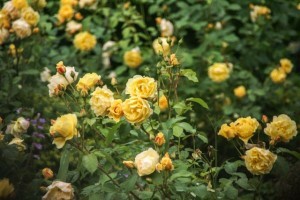 Massive flagstones wander unevenly across the floor, and mullioned windows in the small dining room frame the yellow roses in the garden like a Monet painting. Light green walls and cream-painted woodwork give the rooms a springlike atmosphere, and the furnishings are both eclectic and comfortable. But this isn’t the part of the house where we spend most of our time. 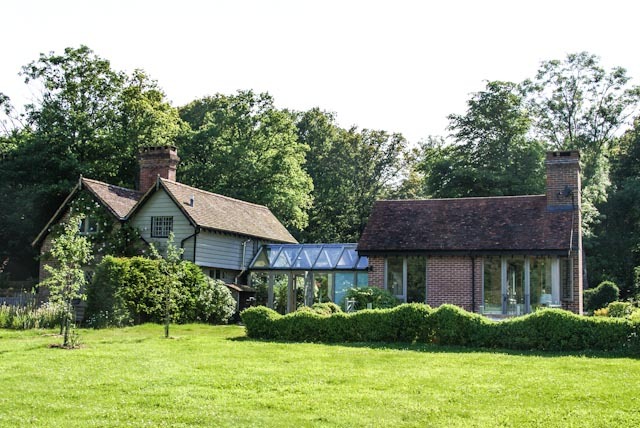 There were long-disused dog kennels and runs on the property, so (using the original footprint) the new owner obtained planning permission and designed and built a stunning modern addition linked to the old cottage by an all-glass conservatory. The ground floor of the addition consists of one large, airy room encompassing kitchen, dining room, and sitting room, with walls of glass where all the windows and doors can be opened to bring in even more of the outdoors. 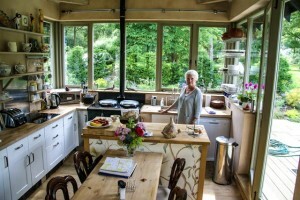 The kitchen has an Aga (that and a free-standing shower are really Gerry’s only requirements for renting a house), a brand-new glass cooktop, a dishwasher, a big side-by-side refrigerator, and more wooden countertops than even we can clutter up. The sitting room has a huge fireplace, a big, comfortable sofa, three easy chairs, and a flat screen TV that gets what seems like every channel available in the UK, and has a DVR, so we can record programs — no, programmes — that are on too late for us to stay up for. The master bedroom and bath are downstairs, in a cleverly constructed daylight basement with smooth concrete floors, a separate shower room, antique rugs, and a fascinating collection of art and collectibles. There is a skylight in the ceiling over the bed (visible in the photo later on that shows the deck around the “new” part of the house), and we wake up to the prints of little animals and large birds on the glass overhead. This morning, two glossy rooks competed for deck space, walking over the skylight and uttering loud challenges, accompanied by mysterious thumps. Oh, and there are bookcases loaded with books all over the house, from very recent novels (like Hilary Mantel’s Bring up the Bodies, which I read just before we left home) to biographies and travel books and history books and anything you might be interested in. The variety of the reading material reflects the wide-ranging interests of the owner and her husband, giving us a sense of who they are without ever having met them. The house comes with staff, although they seem more like neighbors we’ve learned to like immediately. Amanda met us at the house and took care of all our problems, large or small, with unfailing good humor. She arrranged for the RAC to send a mobile auto mechanic’s shop to the house to see what could be done about the car. She coaxed our laptop into better behavior and showed us how to do it ourselves later, if necessary. She recommended a local barber for Gerry and a good dry cleaner when we need one. She showed us where all the light switches are (no small thing) and how to call for help in an emergency. Everyone needs an Amanda. And we have a woodsman! Clive, Amanda’s partner, is apparently capable of doing everything. He takes care of the chickens and the horse (yes, we have a horse) who live at the bottom of the garden, and he brought us two fresh brown eggs one morning, with apologies because the chickens don’t lay many. 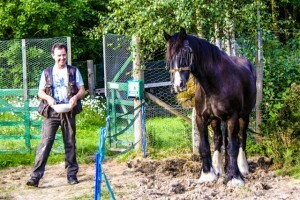 The horse, William, is a 20-year-old Irish cob who used to pull a wagon, but is now retired to his own daisy-rimmed pasture where he keeps a close eye on the comings and goings up at the house. Clive brought us a big jar of horse treats, and every afternoon I take a handful down for William. He hears me as soon as I step out the back door and ambles up to meet me at the corner of the fence. The first day, he shied away when I tried to pet him after I’d given him his snack, but now he lets me stroke his soft nose and brush his mane back from his eyes. Clive and Amanda are also looking after the owner’s little dog, Duster, a small brown terrier who sometimes comes to the kitchen door if we’re visible in the room. She gets treats, too, of course. And now about the owner of this wonderful house: Pom Oliver is a most remarkable and unusual woman. She and her husband are both independent film producers, and she was a member of the first all-woman team to walk to both the North and the South Poles. Recently, shes been involved in establishing a woodcraft and woodland skills center on part of the property, and it seems to be up and running quite successfully. For more information on Pom and her team and what they do here in these beautiful woods, go to their web site: www.woodlandskills.com. She came over for coffee a couple of days after we arrived, and we enjoyed meeting and talking with her enormously. We look forward to a longer get-together in the future with both Pom and her husband. And now, finally, about the car. A big RAC van arrived at the house our second morning, and a very nice young man checked everything he could without taking the car on the road. So he asked me to ride with him while he tried to replicate the problem. I was beginning to think it really was just me when we stopped at an intersection and the engine died. After three or four similar experiences, we were heading back to the house to arrange for a different car when the mechanic, just to make sure, stopped a couple more times. After the second stop, the car started up again on its own, and his face lit up. It turned out that the engine is supposed to turn off when the car is stopped in gear with the driver’s foot on the brake. As soon as you take your foot off the brake, the engine purrs back to life and off you go. Aside from being extremely put out at the rental car people for not mentioning this tiny detail (of course there’s no owner’s manual in the car), I was so relieved to know what was going on that I could have hugged that Audi, mud and all. So we kept the car, and it performs beautifully. Next time I’ll tell more about life in the Sussex countryside. Meanwhile, if you’d like to see a gallery of pictures of Keeper’s Cottage and its surroundings, click here. For anyone who has been wondering where the posts are for the rest of our river cruise, I promise to get to them now that we have reliable internet access and a much less demanding schedule. Cruises as port-intensive as ours was, from the Black Sea to Amsterdam, leave very little time for keeping a journal. Add to that the fact that we were without a keyboard until we got to Vienna, and virtually without the internet from then on, and you can see why I got so far behind. 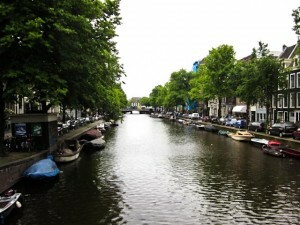 But once we boarded the plane in Amsterdam for the one-hour flight to Gatwick, we really began to unwind. As we flew over the southeastern part of England, dropping in altitude by the minute, I could see the familiar green countryside spread out beneath us in a one-tone patchwork quilt of fields, hedges, and pastures. I never tire of that view of England, especially on a beautiful sunny day. Our luggage arrived on the baggage carousel without incident, and we collected our rental car, fished our big AA Road Atlas out of the carry-on, and set out for the village of West Hoathly. Gerry navigates and I drive in England, except for his solo trips to the nearest shop for a newspaper, and it doesn’t take more than a few minutes for both of us to slip back into our routine. Of course, unfamiliarity with the car (an Audi wagon with way too many bells and whistles) resulted in some hard braking, and the engine died at the rental car exit gate, but we thought it was just that I hadn’t relearned the finer points of right-hand drive and left side of the road traffic. 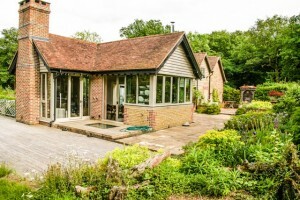 We are renting a house in the country not far from Billingshurst and Horsham, in West Sussex, and the term of our stay runs from June 20 to July 25. 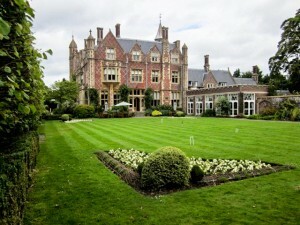 Because of our internet problems, we hadn’t been able to make an online reservation for June 19, our first night in England. The owner of our house had suggested Gravetye (pronounced just the way it’s spelled: Grave-tie) Manor, a country house hotel not very far from where we’re spending the next five weeks. We didn’t have any information about it except that it looks beautiful, has an excellent chef, and is a member of the Relais & Chateaux group of hotels, no small recommendation. And we didn’t have a reservation, so the chances of our getting a room at the inn were slight. I followed Gerry’s instructions as he directed me along extremely narrow roads, all of which seemed to be undergoing some sort of construction project requiring the traffic to make a detour (without any road signs to indicate where we actually were); but quite suddenly we found ourselves in West Hoathly, the village outside of which Gravetye Manor is located. A little further along the road we saw a nicely lettered sign telling us to turn right to get to the hotel. A long, winding, narrow road led us eventually to a spectacularly beautiful 16th-century country house, set behind flowering borders, with a walled garden on each side. I couldn’t magine that there was a vacant room, but Gerry went in to speak to the receptionist while I waited in the car and reveled in the quiet of the countryside. 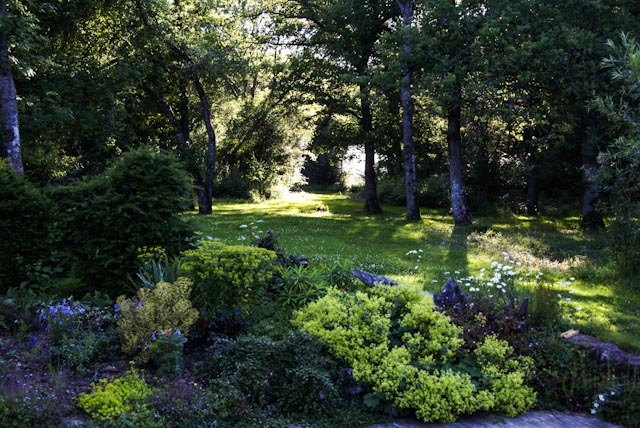 In a very short time, though, a friendly and enthusiastic Irish porter extracted me from the car, collected our overnight bags, and ushered me inside, accompanied by a lilting stream of praise for the gardens behind the house. 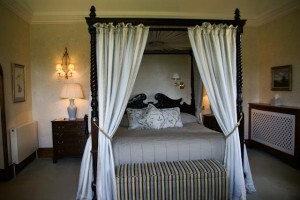 We had been given, he said, the most beautiful room in the hotel, which would be ready for us shortly. Meanwhile, would we please step outside, take a seat at one of the tables tucked away in various corners of the garden, and someone would bring us a drink while we waited. Dazed and a little overwhelmed, we sat down on blue canvas chairs and let the pure perfection of everything we could see wash over us. 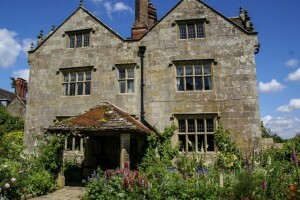 The house, of warm grey stone with tall brick chimneys, was built in 1598 by Richard Infield for his bride, Katherine; and the initials “R” and “K” can still be seen carved over the entrance from the formal garden. Set in a thousand acres of parkland, the estate managed to escape much of the political turmoil of the centuries and even today seems to embody a deep sense of peace. Its most notable owner, however, should be given credit for giving this beautiful place its unique and enduring character. 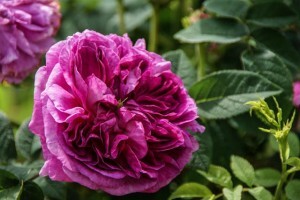 William Robinson was one of the greatest gardeners of all time. 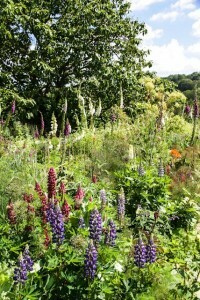 He was a pioneer of the creation of the English natural garden, a concept that has been admired and copied all over the world for over a century. His books on gardening are still in print and selling well. He bought the manor house and its surrounding thousand acres in 1884, and he created at Gravetye the kind of garden he had always sought to design, one that enhanced the natural beauty of its setting. 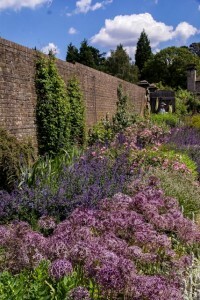 We were reminded of the gardens at Upton Grey Manor in Hampshire, where we stayed five years ago, which were designed by the equally great English gardener Gertrude Jekyll. She was an Arts and Crafts-era gardener, but we’re sure she must have known of Robinson’s work and even, perhaps, have known him as well. 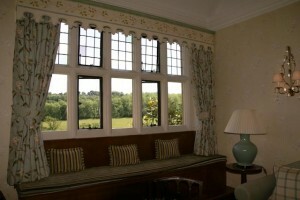 Robinson lived in the house until his death, well into his nineties, in 1935; and during his time there, he made tasteful improvements to the interior (not following the trends of the time, fortunately). He panelled the interior walls with wood from the estate and added “modern” conveniences like fireplace furnishings in the rooms. But the principal work undertaken by the new owners is the restoration of the gardens as envisioned and developed by William Robinson. A staff of seven gardeners now looks after the property, one of whom always brings his beautiful dog, Vera, to work with him. 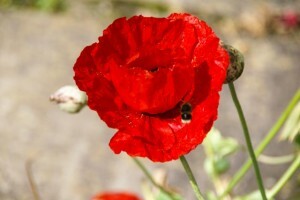 When I was walking around for a last look at the gardens, he cut me a bouquet of bright red poppies to take with me. Such a beautiful, welcoming place, and something we would never have found on our own. Dinner, as expected, was a treat. The dining room is small and elegant, with lovely paintings on the walls, fresh bouquets of flowers from the gardens on the tables, and a superb prix fixe menu of wonderful dishes. Breakfast the next morning was equally delicious (Eggs Benedict for Gerry, “full English breakfast” for me), and then we made our leisurely way to The Haven and Keepers Cottage. 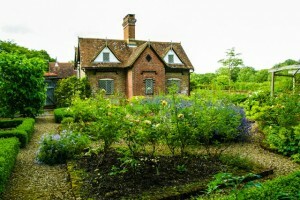 To see more of the house and gardens, click on this link. While the Treasures made its leisurely way up the Rhine to Amsterdam, coaches took the passengers by land, a much faster route than the river, so that we would have most of the day in the city. The Tauck tour director on our bus, a very bright young American who is married to a Bulgarian woman he met in Finland (!) 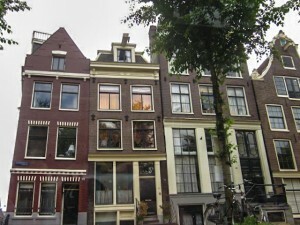 and who now lives in Sofia, gave us a condensed but very interesting history of the Netherlands as we drove. The first thing we noticed was that the Dutch highway system should be the envy of the rest of the world: smoothly paved, well designed, and comfortable for driving on, even on a rainy gray morning. I’d heard Holland described as “the Low Countries,” but somehow I’d never put that phrase together with the actual name of the country: the “Nether Lands.” As we learned, a fifth of the country lies below sea level, mainly as a result of uncontrolled peat harvesting well into the 19thcentury, and much of the rest of the country is only three or four feet above sea level. Over time, after enduring massive and destructive floods, the enterprising Dutch developed several methods of controlling the water. One of the more interesting, which we could see examples of from our bus windows, is the construction of polders: low-lying tracts of land are protected by dikes around their perimeter, and the water level in these man-made lakes is carefully controlled by pumping water out through sluice gates when it is too high and letting it back in when the water level drops. But flooding will always be a serious problem in the Netherlands, especially as climate change continues to raise the level of the North Sea. For a small country, the Netherlands has contributed much more than its share to the world’s trade, art, exploration, and political development. In the 17th and 18th centuries, the Dutch explored and colonized all over the globe. In our travels, we’ve seen evidence of their activity in the Caribbean, the East Indies, India, and Africa. The Cape Colony (now the country of South Africa) was settled by the Boers, Dutch farmers who traveled in huge ox-drawn wagons from the coast to the inland territories where they made their homes. Willemstad in Curacao still looks like an 18th-century Dutch town. Indonesia carries many reminders of Dutch colonization. But one of the biggest mistakes the Dutch made during this period of expansion was to agree to settle a dispute with England over competing claims to plantation land in Guyana. Eventually, the Dutch chose to keep the colony of Suriname, recently captured from the British; in return, they gave up a small trading post in North America called New Amsterdam – now known as New York City. In the world of art, though, especially 17th-century painting, no one compared with the Dutch. Anyone who has ever been to a good museum or taken a class in art history can identify a half-dozen Dutch painters: Rembrandt van Rijn, Johannes Vermeer, Jan Steen, and – in the 19th and 20th centuries— Vincent van Gogh, Piet Mondriaan, and Willem de Kooning. Erasmus was Dutch, and philosophers like Spinoza and Descartes did their work in the Netherlands. No pocket history of the Dutch, though, can omit what happened in this country in World War II. The Netherlands had decided to remain neutral, not a bad decision given its precarious geographical position between the North Sea, Belgium, and Germany. But the Nazis had other plans and invaded in May 1940, overrunning the entire country in a week. The Netherlands’ 100,000 Jews were rounded up and shipped off to concentration camps in Germany, Poland, and Czechoslovakia. A few Jews were hidden by sympathetic Dutch Gentiles, but eventually even they were betrayed (the Amsterdam family of Anne Frank being perhaps the most well known example). At war’s end, only 876 Dutch Jews had survived. But the rest of the Dutch population faced its own privations: the Germans took all their livestock, their crops, any food they had managed to keep in store, and shipped it to Germany to feed the German army. When liberation came in 1945, the Dutch were literally starving, and American military transport planes flew tons of food into the country to keep the people alive, in a preview of what they would accomplish during the Berlin Airlift four years later. Because of the strategic significance of the bridges over the Main and Rhine during the war, some of the most famous military campaigns were waged to capture or defend bridges. I mentioned the bridge at Remagen in my last post, but even better known today – because of Cornelius Ryan’s book A Bridge Too Far and the 1977 film of the same name – is the bridge at Arnhem in the Netherlands. In September 1944 an ambitious campaign was launched by the Allies to capture most of the remaining bridges across the Rhine so that they could skirt the Siegfried line and sweep into Germany through Holland, ending the war by Christmas. Called “Operation Market Garden,” it was essentially a British plan, endorsed by General Eisenhower. Thirty-five thousand paratroopers were to be dropped behind enemy lines by parachute or glider, take and secure the more southern bridges, and get to the last bridge at Arnhem in two to three days. British intelligence believed that only a minimal German army presence was in the area, so that the plan had a good chance of succeeding. However, Dutch underground reports warned that there was a Panzer unit at Arnhem; General Montgomery discounted these reports. Unfortunately, the Dutch were right. American troops succeeded in capturing the bridge at Nijmegen, but the British met fierce resistance at Arnhem, the northernmost target of the operation, engaging in house-to-house fighting for several days. To make matters worse, their radios did not work so they couldn’t communicate with their widely-dispersed troops. After suffering terrible losses, the British were forced to surrender, and the failure of “Operation Market Garden” still stands as one of the worst missteps of the war. Our time in Amsterdam was limited, but we did manage a visit to the temporary quarters of the world-famous Rijksmuseum, which houses a small but select collection of art from the enormous museum while it undergoes some repair and renovation. With the help of a very knowledgeable local guide, we learned a great deal about Rembrandt, his life, and his work. The artist was not only a superb craftsman, but he had a very modern eye for composition. 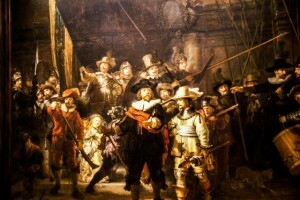 His most famous painting, “The Night Watch,” which was done as a commission for a civic group, is not at all what one would expect a 17th-century group portrait to look like. The figures appear to be in action, not standing stiffly, best foot forward, to have their likeness recorded for posterity. Some are slightly blurred, as if they were moving. We’re quite sure the subjects of the painting weren’t thrilled with the result, but what a brilliant, timeless, emotionally involving work of art it is. Amsterdam is famous, of course, for its network of canals, meticulously planned in the 17thcentury and still in daily use. We took a lunch cruise on a canal boat and got a – well, not bird’s eye, but whatever the equivalent would be from below street level – view of the heart of the old city. Tall townhouses built in Dutch Renaissance style line the cobblestone streets that edge the canals, and houseboats anchored along the banks provide picturesque (and expensive) housing for some of the city’s more bohemian residents. One of the houseboats is actually a cat adoption shelter, so apparently Dutch cats don’t mind living on the water. A pair of swans herded their five cygnets out of the way of boat traffic, while a flock of ducks paddled alongside our tour boat hoping for lunch leftovers. 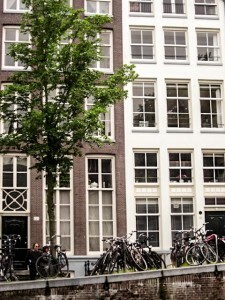 The 1671 Portuguese-Israelite Synagogue in the center of Amsterdam is reputed to be the oldest public synagogue in western Europe. We don’t know how many members it has now, or even if it is an active shul, but its size indicates that once it must have had a very large congregation, especially for when it was built. It was just another reminder of how different the population of most European cities was before the war. The main hazard to life and limb in Amsterdam today is not falling into a canal, but being run down by one of the thousands of bicycles that whiz around the city. Cars are discouraged in town, for very good reason (narrow streets, no place to park, lots of foot traffic), and the terrain is flat, so travel by bicycle makes sense. But woe betide the unwary pedestrian who sets foot in one of the bike lanes – cyclists have the right of way in their lanes, and they’ll take it even if they aren’t in a bike lane. Given the speed they travel, I think it would be suicidal to argue with them. Another of Amsterdam’s distinctions is its red light district (which we didn’t visit, having seen the bigger one in Hamburg years ago). And its famous “coffee houses,” where every variety of marijuana is on offer. Although drugs are not legal in the Netherlands, the authorities seem to have decided to look the other way as long as everyone behaves well. Prostitution, on the other hand, is legal and government regulated. The women pay taxes on their income, are required to have regular health inspections, and as a result, have no pimps. 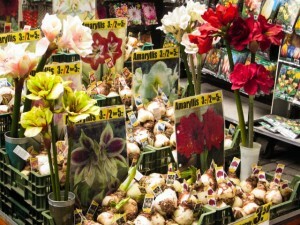 The floating flower market along one of the main canals is a paradise for home gardeners, with every type of bulb neatly packaged and described. Tulips, tulips, tulips, of course, but also amaryllis, hyacinths, daffodils, paperwhites, and more than I could name. Florida is not hospitable to flowering bulbs, except indoors, so we make do with one or two amaryllis in big pots every year. But it would be a wonderful experience to see the Dutch tulip fields in bloom in the early spring. With this visit to Amsterdam, our 24-day European river cruise came to an end. We found it one of the most interesting and enjoyable travel experiences we’ve had, not least because of the professionalism of the Tauck employees at every level. The Treasures is a beautiful new riverboat, with comfortable accommodations and well-designed public spaces. The entire ship sparkles with cleanliness and polish. The crew is attentive and eager to comply with every request. Although we found the food onboard in general to be good but not exceptional, this didn’t detract from our cruise experience. The Tauck cruise director and the five Tauck tour directors we encountered during the cruise couldn’t have been more knowledgeable and helpful. All the local guides were excellent, and all had had a good deal of previous experience with Tauck. We loved the itinerary – it was the main reason we chose this particular cruise, and we weren’t disappointed. We hope you have enjoyed following in our footsteps as we went from the Black Sea to the North Sea on three of the world’s great rivers. And now for a few of the more memorable highlights: In Budapest, as we relaxed on the sun deck of the ship before lunch one day, we were puzzled at the sight of a very large military helicopter, accompanied by a much smaller civilian one, flying overhead down the Danube. In a few minutes, the duo passed overhead again, this time flying upriver. I asked myself whether we might be at war and no one had told us. But after a couple more of these maneuvers, we were told when we went down to the dining room that a movie company was in town filming a new action movie, and that Bruce Willis was in the army chopper while the camera crew was filming him from the little one. This was our first river cruise, which might surprise those of you who know us well and know how we love to travel. We’d sort of saved it for a time when we didn’t feel up to doing the more strenuous trips, like Antarctica, in the (mistaken) belief that a river cruise would be a leisurely, relaxing trip, floating along and looking at the scenery. Well, there was some of that, but almost every day we were in a port — or two — and doing a lot of walking and climbing and standing. So if you’re considering taking a cruise on a riverboat, we suggest that you don’t put it off too long. You will love it, but you should be in reasonably good shape. We highly recommend this way of seeing the world from its rivers — even familiar places look wholly different, and more beautiful than we ever imagined. As is this ever-changing earth we call home. 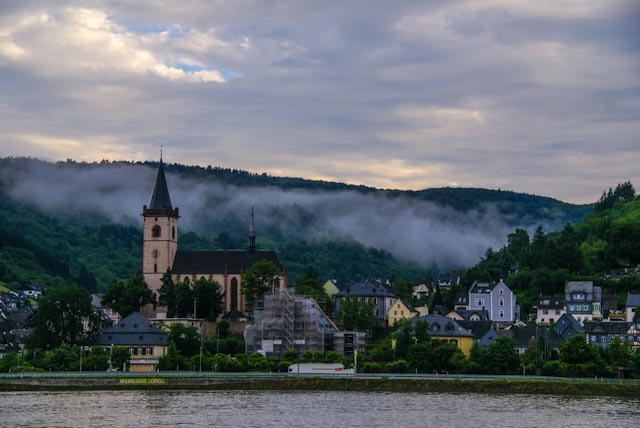 One of the oldest cities we visited – and one about which we knew nothing – is the fascinating town of Koblenz, situated on both sides of the Rhine at its confluence with the Moselle (hence its name, which comes from Latin for “at the merging of rivers”). 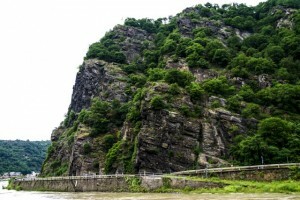 On the eastern bank of the Rhine stands the impressive Fortress Ehrenbreitstein, a medieval citadel occupying the summit of a steep, rocky hilltop. Directly across from the fortress is the Deutsches Eck, or German Corner, a triangular spit of land that looks like the prow of a ship and marks the spot where the waters of the Rhine and the Moselle merge. 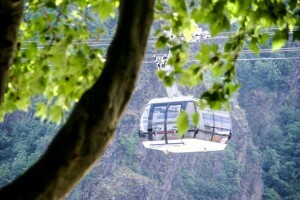 Germany’s biggest aerial tramway, the Koblenz Cable Car, completed in 2010, is a popular tourist attraction, carrying passengers from the German Corner across the Rhine to the top of the fortress. 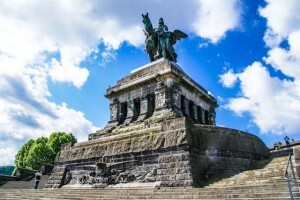 This small riverside park is really famous, though, for the 1897 monument to Kaiser Wilhelm I, mounted on a 45-foot-tall horse, which came to symbolize the resurgence of the German Empire and Germany’s refusal to recognize any French claims to the region. 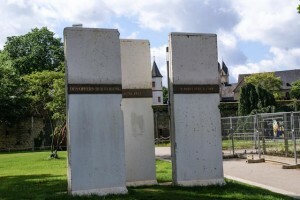 In 1945, the statue was destroyed by US artillery; the French who subsequently occupied Koblenz wanted to blow up the whole monument, but the stone base remained more or less intact. 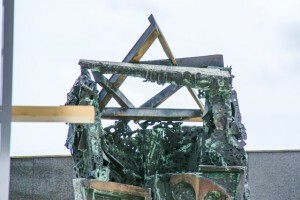 In the 1950’s, what was left of the monument was rededicated to German unity, and a copy of the statue was placed back on top in 1993, funded by private donations. Interestingly, three panels from the Berlin Wall stand in this park as well, a reminder of the actual reunification of Germany after the disintegration of the Soviet Union and its satellites. We had never seen any of the real wall before, and the simplicity of this memorial was very moving. It reminded us of the Vietnam War Memorial in Washington, DC, and why it is so much more impressive than the more elaborate war memorials with their massive columns and classical architecture. Another small memorial plaque along the riverfront is in remembrance of the Jews of Koblenz, who were, as the tablet baldly states, taken from their homes to concentration camps and murdered. The citizens of Koblenz certainly haven’t glossed over what the Nazis did to their fellow human beings. The park includes a display of all the flags of the European Union nations, plus the flags of the German states, which makes an impressive sight when the wind blows. Along the waterfront, an organ grinder played traditional German songs, accompanied by a stuffed toy monkey. The first song I heard was “Freut euch den Leben,” which was coincidentally the first song I learned to play on the accordion in 1949 in Munich. Hated it ever since. 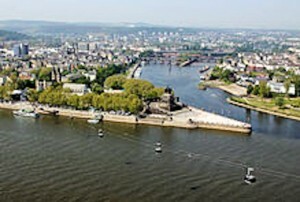 Koblenz has existed as an inhabited settlement since 8 BC, when the Roman general Drusus established a military post on the site. [Drusus was an interesting man – he was the son of Livia Drusilla and the stepson of the Roman Emperor Augustus. He was also the brother of Tiberias, father of Claudius, grandfather of Caligula, and great-grandfather of Nero. If you watched, as we did, the landmark miniseries I Claudius in the 1970’s, all these names will be familiar to you. In any event, Drusus seemed to have escaped the decadence and intrigue of his family history by being a good soldier and a brilliant leader of troops. He was also the husband of Antonia, the daughter of Marc Antony, and was reputed to have been completely faithful to her, something of a rarity among Romans of his class.] The city celebrated its 2000th anniversary in 1992, which makes it 2010 years old today. But Fortress Ehrenbreitstein is even older: early fortifications were built on the hill around 1000 BC, and in 55 BC Julius Caesar’s troops built a bridge across the Rhine from what is now Koblenz to the base of the hill where the fortress stands. The city was apparently both prosperous and volatile, the former because of its prime location for trade and commerce, and the latter because of its prime location for military struggles for supremacy. It has been Roman and Frankish and German and Norman and Swedish and French and Russian and eventually German again. The French, in fact, occupied the city so often over the centuries that many of the local families bear French names, a reminder of the fact that young people will always find a way to get together, even if their countries are at war. 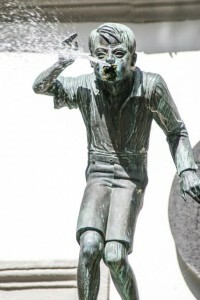 One very clever statue of a little boy in a small plaza in the center of town spits water at the unwary visitor who steps too close. He represents one of the children of these informal alliances. 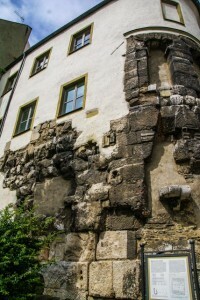 Because of the ravages of centuries of warfare, many of the medieval buildings no longer exist, but the outlines of the old city wall can still be seen in the layout of the streets in the Altstadt. The elegant Palace of the Prince Electors of Trier, dating from 1280, stands in its manicured formal gardens along the west bank of the Rhine, and the 13th-century Marksburg Castle on the Moselle still watches over the city from the north. 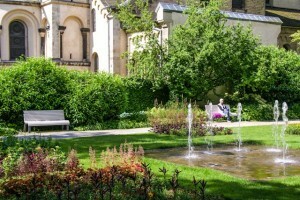 The beautiful 13th-century Church of Our Lady inside the city wall houses a rose garden, fountains, and a lily pond, not to mention some very interesting modern art. Jesuit Square, where the small Rathaus stands behind wrought-iron gates, is bordered by the clean-lined Baroque 17th-century buildings that once were home to the Jesuit College. The long white dormitory has twenty-four shuttered windows on the top floor, which are used as a giant Advent calendar every Christmas. As if to emphasize the cosmopolitan nature of every European country these days, our attractive local guide told Gerry, during a toilet break for the group – he had said to her, “ Now, what’s your story?” — that she was born in Afghanistan to a German-born father and an Iranian mother, whose family fled Afghanistan after the Soviet invasion and eventually settled in Germany. Our guide spoke English and French as well as German and, we assume, some Middle Eastern languages, too. We were reminded just how insular we are in our homes in the US, surrounded mostly by people like ourselves, knowing almost nothing of the lives of those from other parts of the world. When we speak of immigration, we think only of Hispanic immigrants from south of our border, but there is a much greater migration to Western Europe, from nearly every other country in the world. 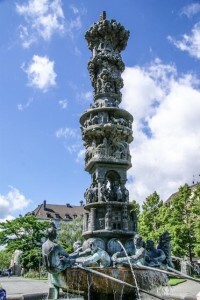 In the central square of Koblenz stands a remarkable and intricately carved fountain and tower, a recent acquisition that depicts the entire history of the city over the past 2000 years. As we followed its progression upward to the modern high-rise buildings that crown its summit, we realized again how very short and relatively uncomplicated our own history is when compared to that of the countries we’ve visited on this trip. Often, we disembark in one town or city for our tours and then re-embark in quite another, since the ship sails while we’re sightseeing. This means that we might have a drive of an hour or more on one of the very comfortable coaches to meet the ship in the next port. During those drives, though, the Tauck tour directors provide us with a great deal of information, including commentary on the countryside we’re passing through. 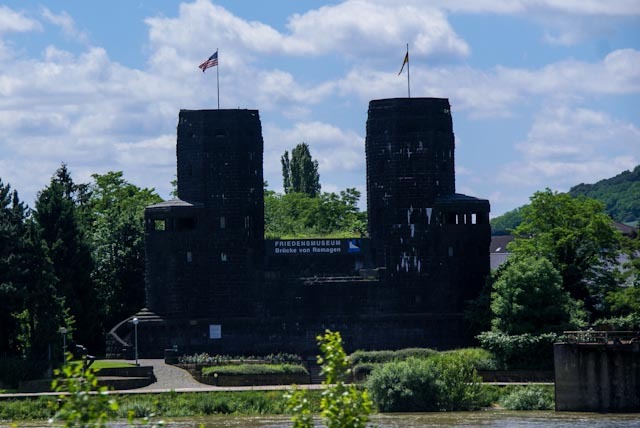 For example, between Koblenz and Cologne, we passed by the town of Remagen, famous for its Ludendorff Bridge – the last bridge standing on the Rhine near the end of the war – captured by soldiers of the U.S. 9thArmored Division on March 7, 1945. The bridge was built during World War I and carried two railroad tracks (one of which was covered over to allow vehicular traffic during World War II) and a pedestrian walkway. When the American troops approached the bridge and found it still standing, they must have been very pleasantly surprised. As a result of the capture of the bridge at Remagen, the U.S. gained a tremendous psychological advantage by crossing the Rhine and pursuing the retreating Wehrmacht, thus boosting their own troops’ morale while letting the Germans know that inevitable defeat was looming. Hitler, furious at this Allied coup, immediately court-martialed five officers and summarily executed all but the one who had been captured by the Americans. The Germans tried desperately to destroy the bridge in the days following its capture, and eventually it did collapse, killing 28 soldiers, despite U.S. Army Corps of Engineers attempts to strengthen it. Fortunately, by then pontoon bridges were in place, and the army had a well-established bridgehead across the river. After the war, there were discussions about rebuilding the bridge, but eventually it was decided to leave it as it was. The western part of the bridge approach now houses a museum, with a small garden at its feet. The support pillars that were blocking the river once the bridge collapsed were destroyed, and now all you can see are the two approaches to what may be the most famous bridge of the war. A flying visit to Cologne concluded this very busy day, since it would have been a shame to come this close and miss seeing what many consider the most beautiful cathedral in the world. This ancient city dates back to Roman times and 50 AD, when a town called Colonia was founded on the Rhine. There are Roman ruins in many parts of the city – in fact, on our way to see the cathedral, our guide walked us through a parking garage where part of the wall of a Roman house abuts a medieval bishop’s escape tunnel, exposed during excavations and preserved quite casually where shoppers and tourists can see it as they pass by. Cologne was a member of the Hanseatic League in the Middle Ages, which gave it great commercial power, and a Free Imperial City during the days of the Holy Roman Empire. which added great political power to its arsenal. As a free city, Cologne maintained its own military force, known as the Rote Funken (red sparks) because of the color of their uniforms. It lost its status as a free city after the wars against the French in the 17th and 18th centuries, when all the territories of the Empire east of the Rhine were incorporated into the new French Republic, and later became part of Napoleon’s empire. One of the vestiges of this period was the Napoleonic code of laws, which remained in use until 1900. Louisiana’s legal system was also based on the Napoleonic code, dating from its days as a French territory. During World War II, Cologne was one of Hitler’s Military Area Command Headquarters and was home to an infantry regiment and an artillery regiment. Its military importance and its strategic position on the Rhine made it a prime target for Allied bombing raids — 262 of them in fact, including Operation Millennium, the first 1000-bomber raid by the RAF. The inner city was completely destroyed during the war, and post-war rebuilding has not generally been an architectural success. Cologne today is characterized by undistinguished 1950’s-style square buildings, punctuated by occasional reconstructed historical buildings. By the end of the war, the population of Cologne had been reduced by 95%, largely because the residents left the city for more rural areas where fewer bombs fell. Pre-war Cologne had a population of 11,000 Jews; when the war ended, essentially all of them had been deported or killed. The six synagogues of the city were destroyed, and only one has been rebuilt. 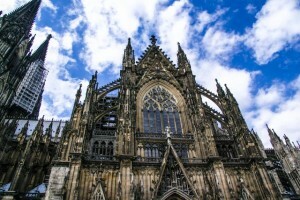 One important building that did survive the war is the city’s most famous landmark, the Cologne Cathedral (Kölner Dom). 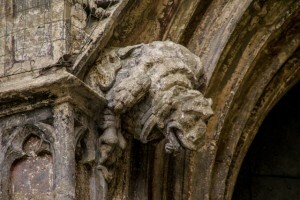 It is Gothic in style, begun in 1248 and completed in 1880. It seems to be continuously under reconstruction and cleaning, so it’s almost impossible to get an unobstructed view of the church. In addition, it is hemmed in on all sides by the city, and its massive proportions make it hard to see more than just a slice of it from any perspective. However, it is a magnificent piece of architecture; and standing inside its vaulted spaces, walking on the colored marble floors that millions have walked on over the centuries, seeing the light streaming through incandescent stained glass windows, it would be hard not to feel awe at the achievements of the men who conceived and created this masterpiece. The most recent addition – in 2007 — to the windows in the cathedral is certainly not something to be ignored. People either love it or they hate it (I fall in the “love it” category), but no one can deny that it’s unique. 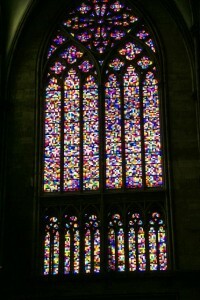 There was a national competition for the design of the window, which was won by Gerhard Richter, one of Germany’s most important living artists. Instead of saints or angels or biblical scenes, he designed a “Symphony of Light” — 11,500 squares of glass in 72 glowing colors – to replace the plain glass that had been installed after the original window was destroyed in the war. Pictures can’t do it justice, but I can try. Cologne was our last port in Germany, and only Amsterdam remains on our itinerary. I’ll try to sum up our whole experience with a few short vignettes in the next post, but for now, I can say that this trip has been unique and unforgettable. I hope you’ll agree. 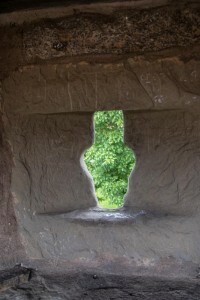 To see more of fascinating Koblenz and Cologne, click here. 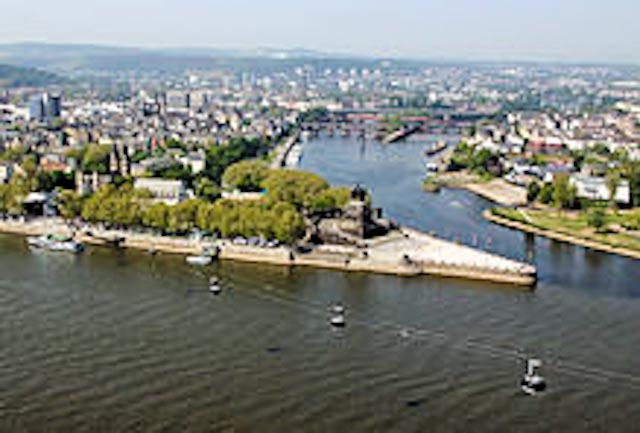 Between Mainz and Cologne is a stretch of the Middle Rhine River known as the Romantic Rhine (although it must not have seemed very romantic to travelers on the river during one particular period of history). The river narrows as it runs between mountains on either bank, providing certain medieval lords whose lands abutted the river with a golden opportunity: they built fortresses on strategic overlooks and forced travelers sailing up or down the Rhine to pay tolls. If a traveler refused to pay, the consequences could be dire, including confinement in the castle’s dungeon or even death. Paying the toll to one of these robber barons (hence the origin of that name) did not exempt the poor traveler from being hauled ashore at the next castle along the river and being forced to pay up again. There were approximately 40 of these fortress toll booths along the Romantic Rhine, but the 38 miles between Rüdesheim and Koblenz were particularly perilous for the river traveler. Twenty-four castles, situated on both sides of the river, loom over this short stretch of water, commanding views both upstream and downstream. And if that weren’t bad enough, right in the middle of this obstacle course is the Lorelei, a rock on the eastern bank of the river that rises 40 feet above the water and marks the narrowest part of the river between Switzerland and the North Sea. Legend has it that the Lorelei was a beautiful enchantress who sat on the top of the rock, combing her golden hair and singing so enthrallingly that sailors would forget to watch for the rapids and the jagged rocks and would founder and drown. The castles were built during the Middle Ages, when the feudal system was at its height. The serfs were tied to the land of their noble lord, who in turn owed fealty to a higher noble, and much of the labor used to construct these large stone structures on seemingly inaccessible hillsides was performed by serfs. However, life was anything but luxurious therein. The castles were not palaces, but fortresses built to withstand attack, and were cold, damp, and dark. The beautiful tapestries you see in museums or in the great houses of Europe never hung on the walls of these very uncomfortable places. The sons of the Rhine nobles were generally trained as knights, and the daughters were allied in marriage with other noble families, all as part of the code of honor and war and the acquisition of power that prevailed during that period. The most interesting – and unusual – castle is actually in the Rhine, on the tiny island of Falkenau. Pfaltzgrafenstein Castle may be only one of the toll castles along the Rhine, but its romantic history makes it unique. Eight hundred years ago, only a single tower stood on the island, which belonged to Konrad, Count Palatine. Having no sons, he sought a high-born husband for his daughter, Agnes, whose children would inherit his title and lands. But Agnes had other ideas: she was in love with Henry, the son of a duke who was a sworn enemy of the Holy Roman Emperor, Friedrich Barbarossa. Since Konrad was allied with the Emperor, the match was out of the question. To make matters worse, Konrad’s wife supported her stepdaughter’s choice of husband. Unable to win the argument, Konrad locked his wife and daughter in the tower on the island to keep them out of Henry’s reach. Unfortunately, Konrad forgot about boats. Young Henry hired a ferryman to take him – and a complicit priest – out to the island, where he and Agnes were married. Nine months later, Konrad’s wife sent a message asking her husband to come to the island. Assuming that this meant the women had finally come to their senses, he arrived at the tower to find that he had acquired not only a son-in-law, but a grandchild as well. Fortunately, the Emperor forgave everyone and even insisted on being the child’s godfather. So one of the Rhine castle stories had a happy ending. Besides castles and their attendant villages, this part of the Rhine is home to some of Germany’s best and best-known vineyards. 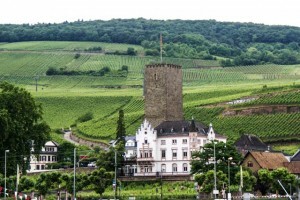 Indeed, most of Germany’s vineyards are located in the Rhine valley. 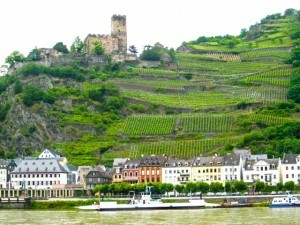 The primary grape grown here is the Riesling, but Rhine wines are typically richer and fuller than Mosel wines from the same grape. To see the rows of grapevines clinging to the steep hillsides in perfect regimentation, blanketing the landscape all the way to the mountains on the horizon, is awe inspiring. The names of the castles are like German songs – Mauseturm, Ehrenfels, Rheinstein, Bromserburg, Reichenstein, Sooneck, Heimburg, Furstenburg, Stahleck, Gutenfels, Schonburg, Rheinfels, Katz, Maus (love those two! 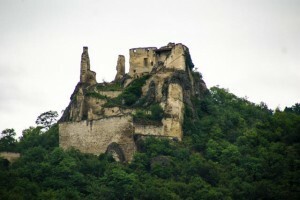 ), Liebenstein, Sterrenberg, Marksburg, Martinsburg, Lahneck, Stoltzenfels, and Fortress Ehrenbreitstein. Most of them are in ruins, destroyed by the French during the Thirty Years War, although a few are in use today as hotels or homes or government buildings in villages. But their majestic remnants speak eloquently of a period in history when robber barons ruled the Rhine and, at least once, love (and a sympathetic stepmother) conquered all. To visit more castles on the Rhine, click here. The Main (pronounced “mine”) River is a major tributary of the Rhine, but it receives much less attention from tourists than its more glamorous cousins, the Danube and the Rhine. It flows from two sources, the Weisser Main, or White Main, which rises in the mountains, and the Roter Main, or Red Main, flowing from the Frankish Forest. Its waters are generally described as yellow, but in all honesty, we couldn’t tell the difference between the colors of any of the three rivers we sailed along. All of them looked brown. 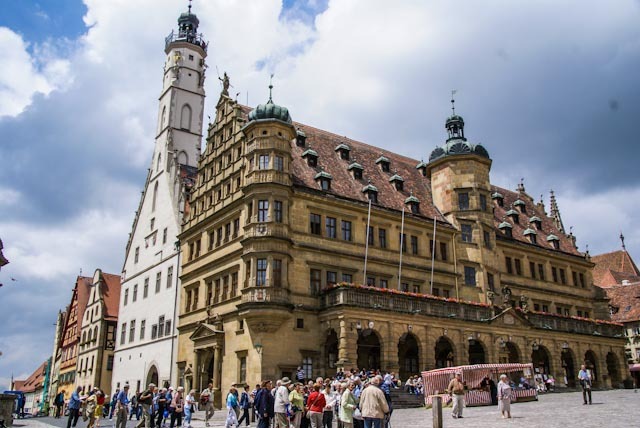 The most famous city on the Main is, of course, Frankfurt, but there are other historic towns and villages along its banks, notably the university city of Würzburg. 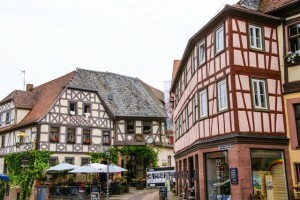 For us, though, the highlight of the Main was the beautiful medieval town of Lohr, where we spent a relaxing afternoon on our own, strolling through its streets. The Treasures docked near the Alte Mainbrücke, just at the foot of the old town, and we walked slowly up from the river, marveling at the storybook perfection of this lovely town. 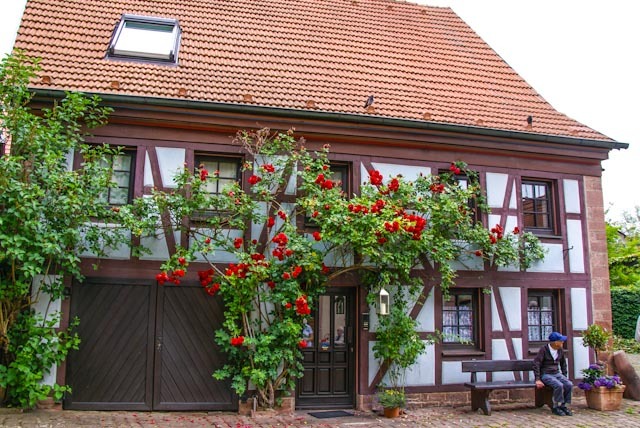 The houses were half-timbered, and nearly all of them had small gardens in full bloom , either in window boxes or climbing over their doors. The town boasts a 14th-century watchtower, as well as a castle, the Lohrer Schloss, which houses the Spessart Museum (the town lies between the Spessart mountain range and the Main). The famous glass exhibit in the museum includes, legend says, Snow White’s mirror. Well, actually it was the wicked queen’s mirror, but it had a definite preference for Snow White. All the buildings in the village seem to have been designed to suit the exact purpose they are being used for at the moment. One lovely white medieval structure in the center of town now houses a pharmacy on the ground floor, where I was able to buy a tube of Voltaren, a topical steroidal analgesic for arthritis (which half the ship seemed to be using), over the counter for seven euros. The more potent version I use at home costs $40 and requires a prescription, another example of how medical care differs around the world. Every building looked as if it had just been scrubbed and painted, and women were sweeping the streets in front of their pristine doorsteps. 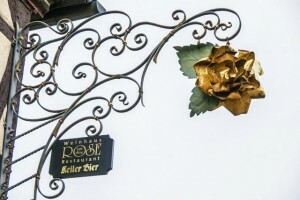 The signs marking hotels, shops and restaurants were made of brass that shone like gold. 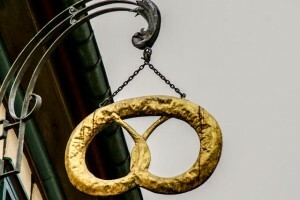 The clever sign for a local bakery was a golden pretzel. Every square inch of the town seemed to be buffed and polished until it gleamed, as if the residents were preparing to welcome a royal personage. Most of the people we saw in the streets were locals, out for lunch with friends or doing their daily shopping. We saw children going home for lunch one by one down the tiny lanes, being greeted by mothers or grandmothers at the door as they shed their book bags. It was an idyllic scene, made even more appealing because it was all real. Rothenburg deserves its reputation as one of the prettiest towns in Germany, with its well-preserved architectural history, its spectacular setting, and its vibrant social scene. But in many ways, we preferred Lohr: very few tourists, beautiful medieval buildings, and an unhurried pace of living made this village unique. Here are a few other images of Lohr that will give you a sense of this lovely town. Rothenburg ob der Tauber, the “Red Fort on the River Tauber,” a beautiful town along the aptly named Romantic Road, is one of Germany’s treasures. The Romantische Strasse stretches 220 miles south from Würzburg through some of the most scenic countryside in Bavaria, dotted with old castles, picturesque villages, rivers, and lakes along its route. The Romantic Road got its name in 1950 from the tourist industry, which wanted to present a more serene and pastoral view of postwar Germany than was prevalent in that period. Judging from what we saw, they succeeded beyond anything they might have hoped for. Rothenburg, like many towns in the vicinity, was once a thriving center for trade and commerce. As one of the “free imperial cities” of the Holy Roman Empire during the Middle Ages, it was responsible to the Emperor directly and was exempt from the local taxation that hobbled other towns. But when the Empire crumbled and the town no longer enjoyed its former privileged status, Rothenburg found itself unable to compete commercially with larger towns situated along the Main River and thus lacked the money to modernize its medieval buildings. Although the citizens of 16th-century Rothenburg might disagree, what a colossal stroke of good luck that turned out to be. The entire town is a living museum, unspoiled and visually unchanged from medieval times. 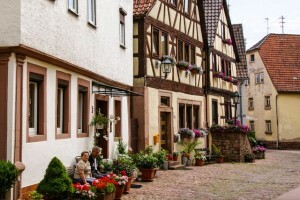 Half-timbered buildings line Market Square in the center of the town, and ancient houses painted in pastel colors lean companionably against each other along narrow, winding cobblestone streets. The old city wall, largely intact after six centuries, still stands guard around the town, including strategically spaced towers with steep steps leading up to a walkway overlooking the valley through intermittent arrow slits. Across the square is a restaurant called the Ratstube, housed in a pale yellow building bearing a small sign saying that in February 1474, King Christian I of Denmark stayed there for seven days. Just the idea that anyone would have records of a royal visit from over 600 years ago is mind-boggling. All around the town, you see small family crests and coats of arms over doorways, indicating that the same family has owned and lived in that house for centuries. We heard a saying during this trip that is very revealing, and very true: In America, 200 years is long; in Europe, 200 miles is far. 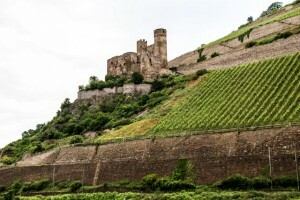 On the western edge of the town, the beautiful Castle Garden sits on the site of what was the 12th-century Hohenstaufen Castle until it was destroyed by an earthquake 200 years later. As we entered the garden through a stone archway, the sound of a flute drifted toward us across the grass. Our guide told us the flutist is a Russian musician who plays in the garden every summer, and his music gave a sense of unhurried peace to the day. Behind him was a breathtaking view of the old town and the deep valley below, with an ancient church and a stone bridge set into the green hills. 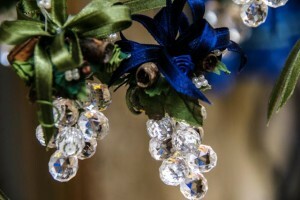 The true jewel of Rothenburg, though, can be found inside the 14th-century Church of St. James. Tilman Riemanschneider was the finest woodcarver of the Middle Ages, and incredibly, much of his work has survived. His main workshop was in Würzburg, where he employed a large team of assistants, but his most famous works are the altarpieces of a chapel in another small town on the Romantic Road, and of St. James Church in Rothenburg. He always worked alone on the life-size figures that dominate his wood sculptures, and his artistry is nothing short of stunning. The altarpiece at St. James is of the Last Supper, but instead of showing the figures posed in the usual symmetrical and static fashion, Riemanschneider arranged the characters to emphasize the human drama taking place in the scene. 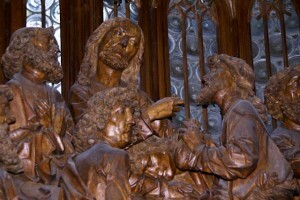 For example, the figure of Judas is front and center, facing Jesus as he speaks imploringly to his master. Jesus’ face shows a sorrowful recognition that Judas has already betrayed him in his heart, while the other disciples seem oblivious to the underlying meaning of the central encounter. 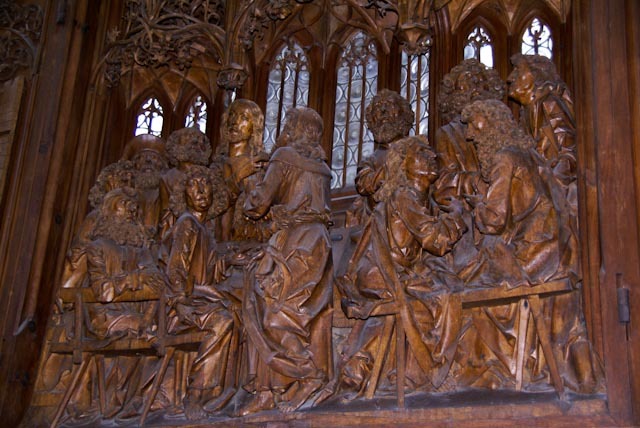 When you look at this magnificent, yet approachable work of art and realize that it was created at the beginning of the 16th century – and that it is carved entirely of wood – you can only gaze at it in wonder. Sadly, Riemenschneider became involved in local politics in Würzburg and was on the wrong side in the Peasants’ Revolt of 1523, resulting in his arrest and imprisonment and the confiscation of his property. When he was eventually released, he was a broken man who had lost the will to continue working. After his death in 1531, his work was forgotten until his grave was discovered by accident during a construction project in 1822. Rediscovered and finally given the recognition he deserved, this great medieval artist would be proud to see the thousands of people who flock to museums and churches along the Romantic Road to marvel at his brilliance. 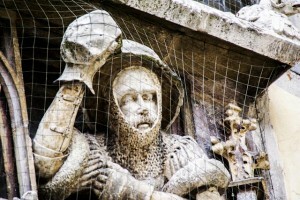 Rothenburg is famous for more than its Riemenschneider carvings, though. This is known worldwide as the Christmas village, where Käthe Wohlfahrt’s German Christmas Museum – and her Christmas shop across the street – bring in hordes of tourists to buy ornaments and nutcrackers and those ubiquitous spinning wooden trees that run on candle-power. (When I was a child in Germany, my mother bought a tree made entirely of brass, with red candles that made the tree spin so that little angels struck tinkling brass bells.) One of our fellow passengers from New Zealand bought four of the wooden trees, and later when I asked her how she was going to get them in her luggage to take home, she confessed that she’d bought another suitcase. 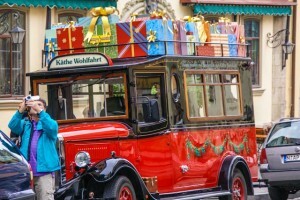 The most atmospheric of Rothenburg’s many seasonal festivals is the 500-year-old Reiterlesmarkt, the annual Christmas market, where individually decorated stalls line the streets and sellers of mulled wine (usually made with local Franconian white wine) do a brisk business. Which brings me to food and drink. 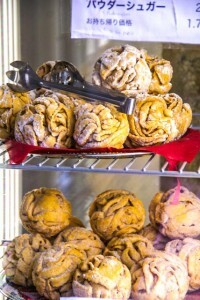 Rothenburg’s specialty is the Schneeball, a softball-size dessert of something like shortbread, covered with sugar, cinnamon, chocolate, coconut, or nuts. One of these calorie and carb-laden monsters is enough for two people to share, but we passed on the opportunity. Instead, for lunch, Gerry and I went to the Gasthof Marktplatz, a restaurant just off the square, which had been recommended by one of our Tauck tour directors. Everything on the menu was tempting – and quite reasonably priced – so it was hard to make a choice. But Gerry decided on liver and onions, while I ordered a dish I’d had once on the ship (and loved so much I asked for the recipe): a bread dumpling in a cream sauce with wild mushrooms. Accompanied by a local red wine (Gerry) and a local beer (me), our meal was absolutely superb. And after lunch, we threaded our way down a narrow street from the Marktplatz to one of the towers that had steps leading up onto the city wall. We’d been told that it’s possible to walk all the way around the town on the wall, but the distance was too far for the time we had available, so we opted to walk up via one tower and down by the next. We climbed incredibly steep stone steps worn down in the center by generations of users, and then walked along the inner walkway, peering out of the arrow slits to the countryside below and imagining what life must have been like in the days when these walls were the only defense this prosperous village had against marauders and invaders. Then down an equally steep set of stairs at the next tower, and we were walking by houses whose windows were punctuated by boxes overflowing with blooming flowers, and where the cars of the inhabitants somehow managed to fit between the buildings that lined the narrow streets. People say Rothenburg looks like a movie set, which is true, in a sense. But without stepping on the toes of the past, real people live and work in this beautiful place where time seems to have stood still centuries ago. 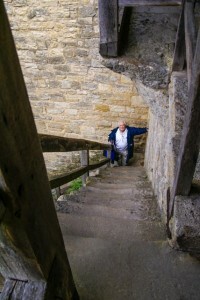 To see more pictures of beautful Rothenburg, please click here. 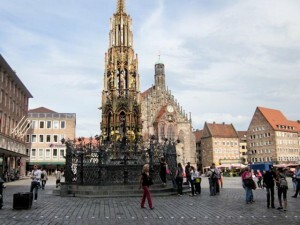 The first time I saw Nürnberg I was eleven or twelve years old, and the entire city seemed to be a vast sea of rubble. (Allied bombers in 1945 destroyed 90% of the medieval city center, and most of the rest of the city was either heavily damaged or leveled.) It was 1950. The war had been over for five years, the Nürnberg Trials for three, and most of the world was war-weary and longing to get past the bad memories and haunting symbols of that terrible time. What I remember about 1950 Nürnberg is a pervasive sense of gray – gray stone, gray skies, gray people moving through gray streets. I know that can’t be the whole picture, but that’s how I see it in my mind’s eye. Revisiting Nürnberg for the first time in more than 60 years, I experienced a severe culture shock. The central city has been entirely rebuilt, including the replication of some of the medieval buildings destroyed during the war. But Nurnberg’s long history as the center of the German Renaissance of the 15th and 16th centuries has been inevitably overshadowed by the role the city played in the rise of the Third Reich, and in the famous trials of the leaders of the Nazi Party that finally exposed to the entire world the extent of the evil perpetrated by Hitler and his followers. 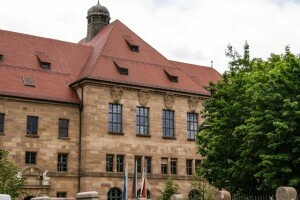 Our tour took us first to the Palace of Justice, a complex of imposing buildings housing administrative offices and courtrooms, where the Nürnberg Trials were held. Courtroom 600, with its four tall windows looking out over a small courtyard to the street, was the site for all the trials and is still in use today, usually for murder trials. Because it was a weekday, we were not permitted inside the building, although tours are given on weekends. But everyone who has ever seen the 1961 film Judgment at Nuremberg, with Spencer Tracy, Burt Lancaster, Marlene Dietrich, Maximilian Schell, and more superb actors than I can count, will remember those four windows behind the tribunal’s bench, feebly illuminating the courtroom. The initial trial, before the International Military Tribunal, brought the 25 most important of the captured leaders of the Third Reich to answer for crimes against humanity. The prosecution was conducted by representatives of the four allied powers: Britain, the United States, France, and the Soviet Union. The chief American prosecutor was U.S. Supreme Court Justice Robert H. Jackson, and the American judge on the panel was Francis Biddle, formerly the Attorney General under President Truman. Twelve of the defendants were sentenced to death (although only ten were executed), seven to prison terms, and three were acquitted. The others died before they could be tried or committed suicide before they could be executed. The defendants were housed during trial in the immediately adjacent prison, to minimize the possibility of escape. Of particular interest to me, though was the Judges’ Trial, fictionally depicted in the 1961 movie. Before a US military court, sixteen German judges and lawyers were tried for war crimes in connection with their application and execution of laws promulgated by the Third Reich. The trial took place in Courtroom 600, and the presiding judge (who assumed the position after the initial judge became ill) was Oregon Supreme Court Justice James T. Brand, a fact I never knew. Our local guide said that the Palace of Justice had been purposely spared in the 1945 bombing raids that devastated the city; even then, the Allies knew that there would be war crimes trials and retribution, and there was no more appropriate place to hold those trial than in Nürnberg, where Hitler got the momentum and the unquestioning support he needed to carry out his plan. Whether by chance or by design, the choice was perfect. Our guide held up photos of one of the rallies held there; the scale of the structure and of the crowds is almost beyond comprehension. 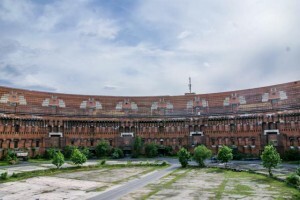 The Zeppelinfeld was one of the few structures originally envisioned which were completed; there were to have been a half-dozen structures on the eleven-square-kilometer site where the Nazi Party could indulge its megalomaniacal fantasies. The Kongresshalle, inspired by the design of the Colosseum in Rome, was intended to be over 200 feet high and to have seats for 50,000. It was left unfinished and at only half its intended height when the war intervened, but it has been put to good use since then. The building was designed in a U-shape, with two large galleries at each end. 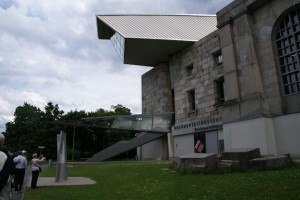 In the south wing, the Nürnberger Symfoniker performs its concerts; and the north wing, with its modern addition that looks like a stake made from glass and steel, houses the impressive museum bearing the tongue-twisting name Dokumentationzentrum Reichstparteitagsgelände. 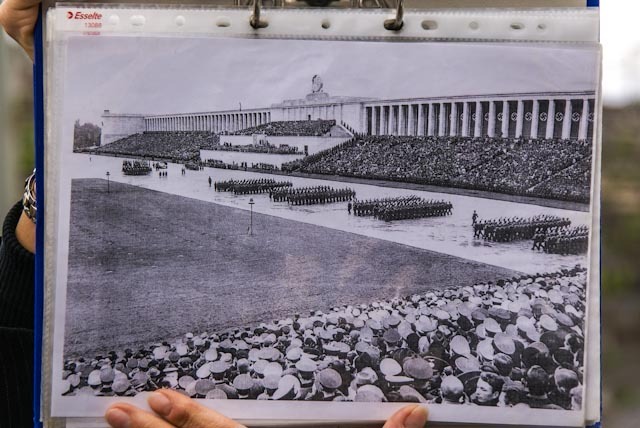 Inside, there is a permanent exhibition called “Fascination and Terror” that charts the rise and fall of National Socialism through pictures, text, artifacts, and film. A well-worn copy of Mein Kampf sits alone in a glass case; huge black-and-white pictures of rallies and parades, Hitler accepting flowers from a child, the rapt faces of young women giving the Nazi salute, skeletal survivors of concentration camps, assault the eye wherever you turn. One particularly interesting film clip showed the making of the 1935 documentary Triumph of the Will, with the brilliant young filmmaker Leni Riefenstahl using her talents and her unfettered access to Hitler to create what may be the most effective propaganda film ever made. Her technical skills, especially given the cinematic tools available in the 1930’s, were remarkable. We could only wonder what she might have achieved if she hadn’t been who she was, when she was, where she was. We left the Documentation Centre in a somber mood, reflecting on the magnitude of the tragedy caused by one man’s monstrous ambition and the willingness of countless others to follow blindly where he led. But one thing was very clear: the Germans have not sought to sweep this terrible part of their history under a metaphoric rug. Every day, groups of schoolchildren visit the museum on a class assignment, as part of their regular curriculum. 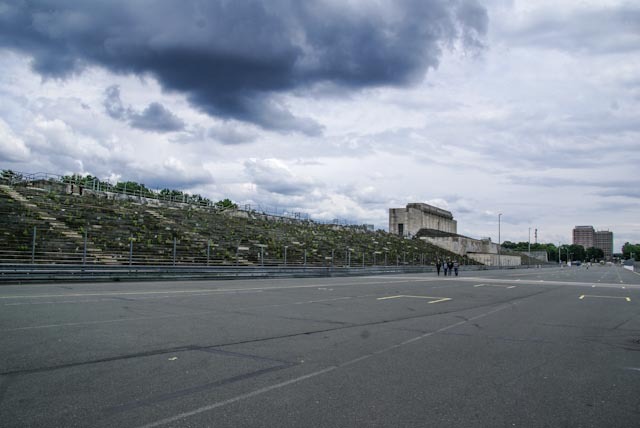 The ruins of the Nazi Party Rally Grounds remain much as they were at the end of the war, stark reminders of the consequences of mass hysteria given legitimacy under the guise of patriotism. That evening, though, it was as if we had entered an entirely different city when we were taken to the Hauptmarkt square in the medieval town center for dinner at a well-known restaurant. A lacy, golden Renaissance church anchored one side of the square, while an equally lacy fountain stood in the center. A farmers’ market was just shutting down, and vendors were packing up their beautiful produce and homemade preserves and taking down their red-and-white striped tents. One young man gave me the sweetest cherry I’ve ever tasted as I admired the fruits displayed in his stall, wishing me a good evening. The Bratwurst Roslein Restaurant, a vast and cheerful place staffed by friendly and very efficient waiters, gave us the chance to try the famous Nürnberg sausages – actually, eight “chances” per person, served with excellent sauerkraut and warm potato salad. Good wine and beer flowed freely, and we walked out of the restaurant into a wash of golden light, window-shopping on our way to the coaches that would return us to the ship. A corner shop with huge windows displayed the name “Bella Schnick-Schnack,” along with some of the wittiest and most original pieces of furniture and art I’ve ever seen. 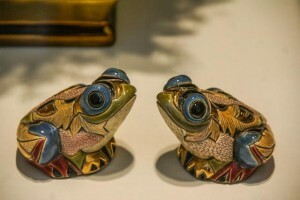 If the shop hadn’t been closed for the night, a pair of ceramic frogs might have gone home with me. So the past is always with us, as it should be, but so is the present. In Nürnberg, as nowhere else on this trip, those two collided in my experience. One thing I think we can say with confidence, though: what happened here 80 years ago can never happen here again. Germany is not the same country, and the German people are not the same people. There is a phrase that came out of the Holocaust: “Nie wieder!” Never again. This is a country that has taken those words to heart. Other photos relating to this text can be found here. When we first considered this cruise, we were unbelievably ignorant about the geography of the part of the world we would be sailing through. For instance, I hadn’t thought about the fact that the Danube flows from northwest to southeast, beginning in the Black Forest and ending at the Black Sea (nice little coda, isn’t it?). But the Main and the Rhine flow from south to north, emptying at last into the North Sea. 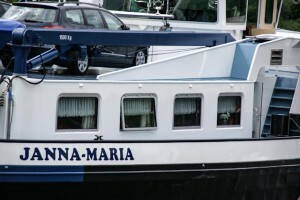 So how does a riverboat get from the Danube to the Main, you ask? The answer is that for centuries, it couldn’t. Shipping goods or armies by water from the south meant that somewhere along the upper Danube, everything had to be offloaded and hauled overland — and over some substantial hills and the Continental Divide — to where the Main was more or less navigable, and then loaded onto other boats to continue their journey northward. The idea of an artificial waterway connecting the rivers has been around for two thousand years. The Romans considered it (after all, they were pretty good at building aqueducts, which carried water above ground level), but they didn’t know how to raise a canal up and over the crest of the watershed, not having developed the technique of lock construction. The first actual attempt at building a canal between the two rivers was made in the 8th century by Charlemagne; his engineers drew up plans and began work on what is known as the Fosse Carolina (Charles’ road). Although the project was eventually abandoned because much of the ground was too marshy, some of its earthworks can still be seen at Weissenburg, near Nurnberg. The idea lay dormant for eleven centuries, until King Ludwig I of Bavaria (not the mad King Ludwig of Neuschwanstein fame — he came later) decided to build a canal as well as a railroad to forge closer ties among the German states. In 1846, after eight years of work, the Ludwig Canal opened for business. It was 107 miles long and 35 feet wide, and ships had to pass through approximately one lock for every mile, which made the trip very slow. The sizeable difference in elevation between the Main (much higher) and the Danube meant that ships had to be lifted up or lowered in order for the canal to operate — in other words, there had to be a lot of locks. As railroads increased in popularity, the canal’s usefulness declined rapidly after 1850, and over the next several decades it fell victim to neglect. But in the 20th century, the project was reconsidered, and a new wider, straighter canal with fewer but more efficient locks began construction. Between 1922 and 1962, the Main was dredged and canalized, resulting in a 185-mile stretch of water with only 28 locks, each with a power station. At the same time, work on the Danube portion of the project was started. In 1992, more than 1200 years after Charlemagne’s engineers began their work, the Main-Danube Canal was opened to link the Danube to the Main and the Rhine rivers, and river traffic now flows freely from the Black Sea to the North Sea. 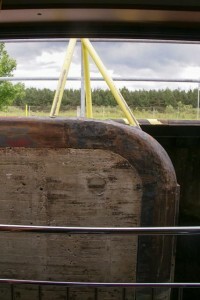 Well, “freely” is a relative word; it seemed as if we were always entering or leaving a lock as we made our way north. 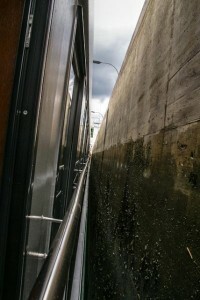 It was a bit disconcerting at times — we would wake up early to bright sunlight about 5:00 a.m., and then gradually we would descend into darkness as the boat was lowered in a lock only about a foot wider on either side than our riverboat. Then, after a while, we would emerge into daylight again. Some of the locks we traversed raised or lowered our boat between 80 and 90 feet, which is pretty dramatic when you’re on a three-deck boat. The sun deck above us was closed to passengers while we navigated the canal because the gates of the locks barely cleared the top of the boat. The wheelhouse was lowered, and the captain steered the ship from a little console on the side deck, using a sort of joystick. All very interesting, and not at all what we’d expected. Barge traffic on the canal as well as on the rivers was quite different from what we were used to seeing on the Mississippi River or the Great Lakes. 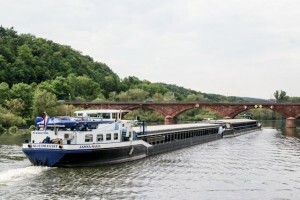 Instead of a tugboat pushing a string of barges, these river barges are self-contained — well, contained — vessels. Typically, the master of the barge lives on board with his wife and their children, who are home-schooled on the river until they are old enough to go to boarding school, usually in their early teens. The barge carries the family car, bicycles, motorcycles, a small boat — everything the family might need for a comfortable life on water. They shop in the towns and villages along the river, have access to medical care when needed (even in an emergency, help is never very far away), socialize with friends who live on other barges, and lead normal, if peripatetic, lives. 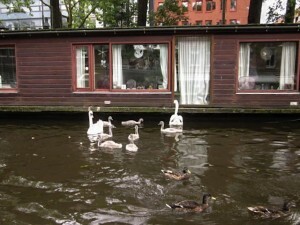 I loved the lace curtains at the windows of many of the barges we saw, signs of a house-proud wife and mother. The scenery along the canal was extremely pastoral, between the locks and power stations. Swans glided along, one mother shepherding three cygnets in varying shades from gray to almost white. 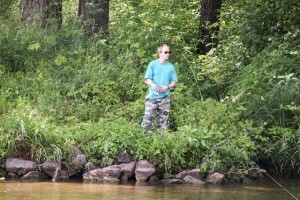 A lone fisherman in camouflage pants along the bank gazed at us without curiosity as we sailed past. All in all, an idyllic morning on the water, in rather jarring contrast to our experience the upcoming afternoon. When you read the next post, you will understand what I mean. At the northernmost point on the upper Danube sits the beautiful city of Regensburg, its medieval heart undamaged by the two World Wars of the last century. It began as a Celtic trading settlement. The site was later used by the Romans as a fort, built in 179 AD and called Castra Regina; one tower from the fort still stands, with its gate, Porta Praetoria, leading into the city. The massive size of the stones used to build the walls of the fort is astounding. 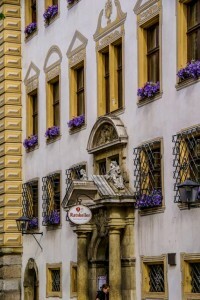 Regensburg has been noted since the early Middle Ages for its beauty: its narrow cobbled streets wind from the river to the center of the town, where the Dom (the Cathedral of St. Peter) rubs shoulders with the Rathaus (the town hall) on the main square. The cathedral was begun in the 13thcentury and completed about 200 years later, so the lowest part of the building is in Gothic style, complete with gargoyles, becoming more ornate the higher it rises and the Renaissance takes over. The twin spires were finished in the 19th century and are so ethereal and lacy that they appear too insubstantial to withstand a high wind. The Rathaus dates from 1250 and is still in use as a city government building. Its main hall is one enormous room whose roof is supported by huge timbers, all original to the structure. The stone carvers who decorated the exterior, though, must have had a wicked sense of humor. On either side above the main door is an ordinary soldier, his features so realistic that you almost expect to meet him around the next corner. One of them holds a rock in his hand, ready to throw it down on the head of the next invader. 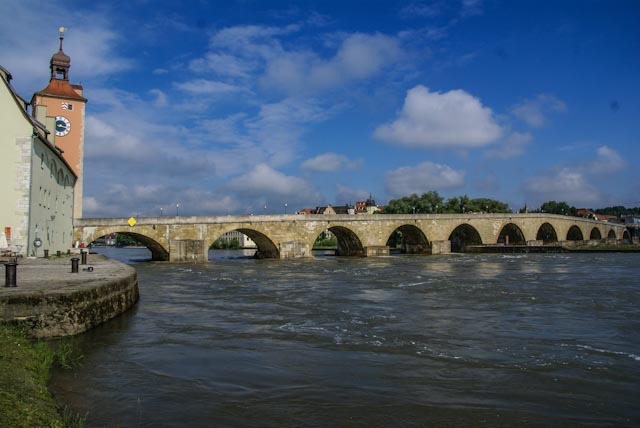 But the city’s most noted landmark is the 12th-century Steinerne Brücke, a stone bridge with fifteen arches that becomes higher and wider toward the center, giving it its distinctive middle hump. At the time of its construction, it was the only fortified bridge on the entire Danube; it is still in pedestrian use today. At the town end of the bridge is the almost equally famous Wurstküche, or sausage kitchen, which claims to be the oldest sausage stall in Germany. Legend has it that the workers who built the Stone Bridge fortified themselves with wurst and sauerkraut from the kitchen between shifts. There is a friendly rivalry between Regensburg and Nürnberg as to who serves the best sausages. The passengers on our tour who sampled both seemed to think Regensburg had the edge. In Regensburg, we saw for the first time shops displaying what we Americans think of as traditional Bavarian dress: cotton print dresses with tight bodices, white blouses, full skirts, and aprons for women, and lederhosen with suspenders, wool jackets or vests, and green felt hats with “shaving brushes” in their hatbands for men. I think Gerry really wanted one of those outfits, but he kept seeing images in his mind of Chevy Chase in National Lampoon’s European Vacation, becoming involved in some Bavarian festival while wearing the full regalia and getting beaten up dancing the Schuhplättler. From Ratskeller to sausage kitchen, Regensburg is a feast for the eyes and the taste buds. It’s no wonder that it is probably the most popular place in Germany for vacationers, German as well as foreign. 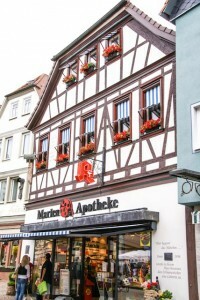 In Regensburg, we also learned something very interesting about German pharmacies. I had a stubborn sinus infection, left over from the bad cold I had before we left home, which wasn’t responding to anything we’d brought along. I was tired of looking like W.C Fields, so we asked the onboard tour director, Steve, for help. He walked us to a local pharmacy, where Gerry asked if we could buy amoxicillin even though we had no prescription. The clerk consulted the on-site pharmacist, who approved the sale, and off we went with a five-day supply. Steve said this result depends on the pharmacy (and presumably the certification level of the pharmacist), but the worst that could have happened was a referral to the clinic across the street, where a doctor would have seen me and written a prescription. Great result, no hassles, and I started my antibiotic regimen right away. Everywhere we go, I try to take pictures of children and teenagers. I think they make wonderful subjects, with their lack of self-consciousness and their natural grace. In Regensburg, I got lucky: there was a “crocodile” of pre-schoolers, hand-in-hand, coming down the steps of the cathedral with their teachers. Their bright little faces were irresistible subjects for photographs, and I snapped away with my zoom lens. And then came one little girl, so German you could have picked her out of a crowd of a hundred children, with round cheeks and a snub nose and corn-silk hair – and her tongue curled like a tube. Priceless. 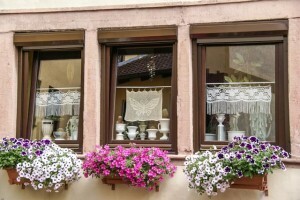 To see more pictures of Regensburg, click here. 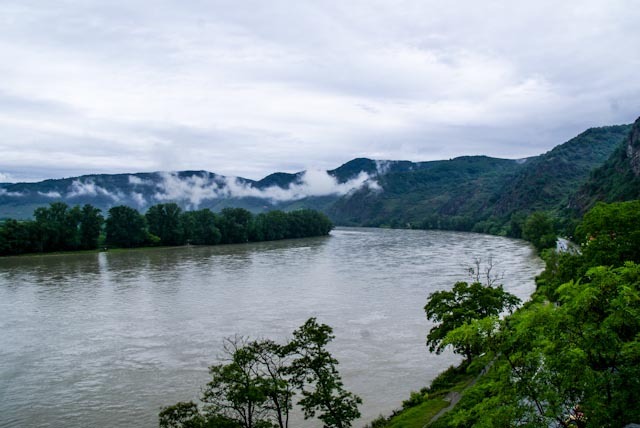 Upriver and west from Vienna lies the Wachau, a valley described by travelers over the centuries as impossibly beautiful, a place of legends and fables and romantic truths (or at least half-truths). 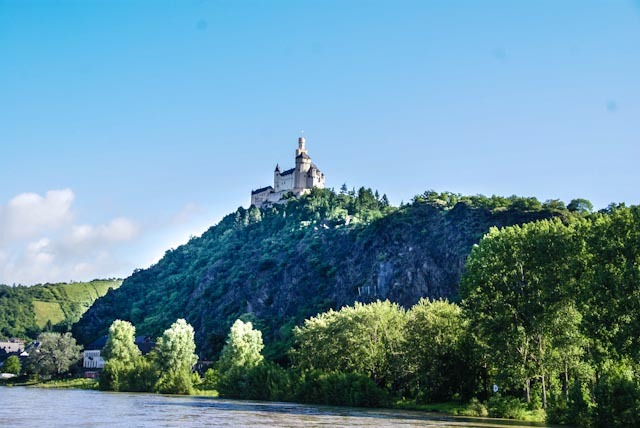 The Danube flows through a landscape of forests, storybook villages, hillside vineyards and apricot orchards, with the occasional ruined castle perched watchfully on a hilltop. 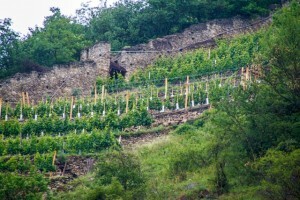 The vineyards date from the time of the Celts, and wine from the Wachau is famous throughout Europe. The apricot orchards may be even older, since the region has been known for its apricot brandy for centuries. But the gem of the Wachau has to be the village of Dürnstein, perched on the side of a hill where the wide Danube curves gently between forested banks. Even on a gray and cloudy day, the brightly painted buildings that line the narrow cobblestone streets glow like candles. Small shops sell handmade glass ornaments, some shaped like clusters of the grapes that grow in stone-terraced rows along the hillsides. You can buy bottles of the local white wine in bakeries and gift shops almost everywhere in town. Though at home we drink red wine almost exclusively, we were glad to learn about the three categories of white wines produced in the Wachau: Steinfelder, Federspiel, and Smaragd, in ascending order of quality. We bought a couple of bottles to drink on the ship and found them excellent. 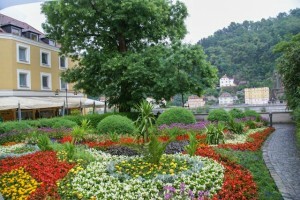 Dürnstein, however, is famous for more than its wine. 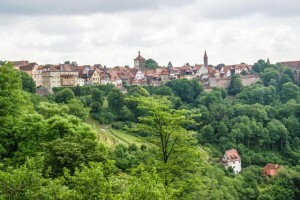 High above the town are the ruins of a medieval castle, the Kuenringerburg, built in the early part of the twelfth century and known throughout history as the place where Richard the Lionheart, England’s crusader king, was held for ransom in 1192. What may not be as well known, though, is the reason for his capture and imprisonment. Earlier that year, Richard’s army had captured the port city of Acre (in what is now Israel), together with the armies of the French king Philip II and of Leopold, the Duke of Austria. After the battle, despite having played only a minor role in the fighting, Leopold raised his standard above the captured city. Incensed, Richard told his knights to take down Leopold’s banner and trample it in a ditch. Leopold never forgot the insult, and later, when Richard was trying to get home to England to take care of domestic problems (remember King John? ), he fell into the hands of his nemesis, Leopold, and ended up imprisoned in the castle at Dürnstein for two years until his ransom was paid. The castle was eventually destroyed in 1646 during the Thirty Years War and was never rebuilt. We didn’t attempt the difficult climb up from the town to the ruins, but I did it in 1986 – in platform shoes, no less – when I was younger and more agile, and I can attest to the stunning beauty of the expansive view from the top. Because of the cold winter in this part of Europe and the heavy buildup of snow in the mountains whose melting waters swell the rivers they feed, our captain was becoming concerned about the height of the Danube as we approached Germany. If the water is too high, the riverboats can’t get under the bridges. 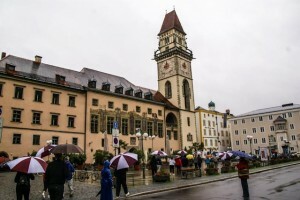 To add to the problem, the weather turned rainy as soon as we left Vienna, and by the time we reached Passau in Bavaria, it was coming down in buckets. Passau is known as “the town of three rivers,” located at the intersection of the rivers Danube, Inn, and Ilz; and it was the Inn that caused most of the trouble, racing down from the Swiss Alps as the snow melted. Despite the rain, we soldiered on and walked from the ship into Passau, widely known as one of the loveliest cities in Germany. 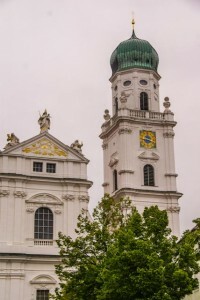 Passau’s Old Town is built on the tapering peninsula between the Inn and the Danube, and narrow streets climb precipitously from the river to the center of the town, where St. Stephen’s Cathedral sits in solitary splendor on a large open square, looking like a wedding cake. It being Sunday, and Passau (like Bavaria in general) being almost uniformly Roman Catholic, all the shops and cafés were closed, even the famous Gummi Bear factory store. But it being Sunday, Mass was being said in the cathedral, which houses the largest pipe organ in Europe, with over 17,000 pipes, and besides, it was raining. So we went to Mass. Really. The interior of the cathedral was simply breathtaking. Towering arches reached toward heaven above a warmly lighted sanctuary, with side altars that displayed beautiful paintings and fresh flowers. The sonorous tones of the bells in the cathedral’s two towers punctuated the words of the German Mass, and the great organ overhead made the stones beneath our feet vibrate like a drum. Passau has a long and colorful history, as do so many of these river cities. A fortified Celtic settlement was established there before 500 BC, its inhabitants engaging in trade, as their successors would do for the next twenty centuries. In the first century AD, the Romans founded a camp, Castra Batava, on the site, as well as a second settlement on the Inn nearby. After the fall of the Roman Empire, the Christian era began and the city was reborn. In 1217, the local bishop, Ulrich, was invested by Emperor Fredrick II with the title of imperial prince, and Passau became an important prince-bishopric. At one time, the prince-bishop of Passau exerted secular power over all the territory from Passau to Vienna and beyond. These prince-bishops were unbelievably wealthy and powerful, since they held both sacred and secular authority directly from pope and emperor. One of the Passau prince-bishops commissioned the composition and recitation of the Niebelungenlied, later to form the basis for Richard Wagner’s four operas of the Ring cycle. Like all medieval towns of significance, Passau boasts an impressive and historic city hall, or Rathaus, dating from the 13thcentury. The building sits on one side of a square facing the river, and murals on its exterior walls depict characters from the city’s storied past. On one corner wall, there is a marker showing the height of the floodwaters during the worst floods in Passau’s history. Only the floods of 1501 and 1595 exceeded that of 1954; the severe flooding of 2002 was lower, though still well over a man’s head. Despite the rain and the closed shops, we loved Passau and could see why it has been such a popular tourist destination over the years. To see more pictures of Dürnstein, click here. Forr more views of Passau, click here. 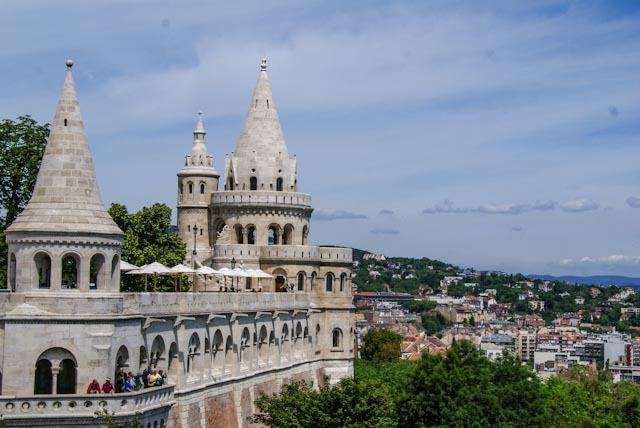 Even if you’ve never been to Vienna, you would probably recognize it the minute you entered the city, whether or not “The Blue Danube Waltz” was playing on the sound system of your tour bus. Interestingly, Vienna doesn’t embrace the Danube the way Budapest does; instead, the river splits into four channels as it approaches the city, none of which is particularly scenic. But Vienna itself is so beautiful, so eclectic in design, so rich in culture, that it would be difficult to think of any other city as closely identified with the Danube as Austria’s capital. Vienna was a Celtic settlement before the Romans established their own town of Vindobona, when the place was a crossroads of commerce by land and river. Vienna became a powerful military stronghold in the Middle Ages because of its geographical situation, but that made the city a tempting prize for invaders. The Turks tried in 1529 and again in 1683 to conquer the city, but without success. 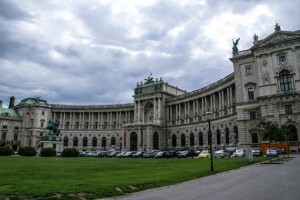 In the 17th century, Vienna became the Kaiserstadt, the Imperial City of the Habsburgs, a role it retained until 1918 and the end of the Austro-Hungarian Empire. Among the more famous of Vienna’s resident Habsburg monarchs were the Empress Maria Theresa, one of whose younger daughters was the ill-fated Marie Antoinette of France, and the Emperor Franz Josef and his Bavarian wife Elisabeth, universally known as “Sissi.” The Habsburgs directed the construction of many of Vienna’s most notable buildings, especially the spectacular Hofburg Palace, the winter residence of the royal family, which houses the Sissi Museum; and the summer home of the Habsburgs, Schönbrunn Palace. What we learned about Empress Elisabeth could fill a complete journal, but suffice it to say that she was very beautiful, very unstable (probably bipolar, certainly narcissistic, anorexic, and even more disturbed than we can imagine), and a most unsatisfactory empress until she had the bad luck to be assassinated — by chance — in Zurich, because the killer’s intended target didn’t show up. The royal apartments in the palace told us a great deal about both Franz Josef and Sissi – his rooms were almost spartan, as royal residences go, and were decorated with family photographs and paintings of his beautiful wife, while hers contained only portraits of Heinrich Heine, her favorite poet, and one picture of her youngest daughter, apparently the only one of her children she liked. I’d thought I wanted to read more about Sissi, but after this visit I’ve changed my mind. I feel sorry for her – she hated the Viennese court and its rigid rituals – but she was truly an awful person, and her behavior toward her children, at least, is unforgivable. She met the young emperor, Franz Josef, her first cousin, when she was fifteen; he was intended to marry her older sister, but when he saw Elisabeth he fell instantly in love with her. So at sixteen, she became the empress, against her better judgment, and things definitely went downhill from there. She had a lifelong battle of the wills with her indomitable mother-in-law, the Dowager Empress Sophie, especially over the upbringing of her children. However, even when she prevailed in that war, she exhibited virtually no interest in those children, and spent most of her life as empress traveling to other countries and staying for months and years at a time away from Vienna. Her only son, Rudolph, died under murky circumstances at the hunting lodge at Mayerling, with his young mistress, and Sissi wore black for the rest of her life (either from grief or because she knew black suited her as she became older). Her adoring husband indulged her in everything, but she did not seem to reciprocate his affection. As beautiful as she was — and the portraits and photographs prove it — she was not an admirable figure. 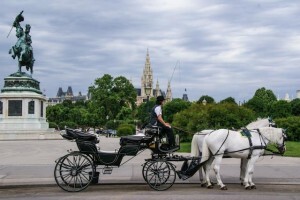 One of the endearing features of Vienna is the presence of open carriages drawn by two matching horses. They line up across from the Albertini like taxis, waiting for their next fares, and the horses are incredibly patient and very beautiful. 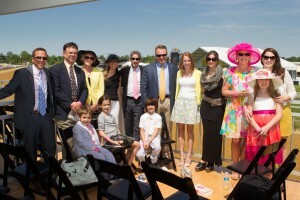 By tradition, the drivers, male or female, all wear black derby hats, just as they did over a hundred years ago. Most surprisingly, the horses seem absolutely inured to the horrendous Viennese motor traffic around them. Maybe it’s the little knitted caps many of them wear on their ears, that make them look like very large pixies. Within the massive grounds of the Hofburg is the famous Spanish Riding School, and we were fortunate to see the young Lippizaners going from the stables to the training arena as we left the palace, and then to see the mature stallions returning from their practice to their stalls. 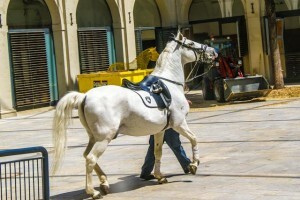 The young horses are dark gray or nearly black, but as they grow older, their coats lighten until they are snowy white. The horses were saved, we heard, during World War II because General Patton was a great lover of horses, and he was given a private performance by these remarkable stallions, after which their custodian pleaded with Patton to save them from the oncoming Russian army. Patton agreed, and these spectacular horses were spared from the sausage factories and went on to become one of the wonders of the modern world. We had a lot of free time in Vienna, some of which we used to look for a new keyboard for our laptop, the original having fallen victim to a badly aimed glass of red wine very early in our trip. On Mariahilferstrasse (Help me, Mary! Street), we found one of the ubiquitous – at least in Vienna — Saturn electronics stores on the fourth and fifth floors of an enormous indoor shopping mall. Everyone in Vienna seems to speak English, but we didn’t expect to find the perfectly accented American English spoken by all the sales clerks who helped us. In no time, we had a new keyboard tucked under our arm, and we wound our way to one of the cash registers, past displays of cell phones, flat-screen TV’s, DVD’s, CD’s, and (I am not making this up) vinyl LP’s, mostly German rock groups but some American jazz . For once, the cashier didn’t instantly recognize us as Americans and gave us the price in euros in German. While I was still unwinding the numbers (acht und swanzig) in my head, the guy in line ahead of us, with his vinyl record purchase in hand, said, “Twenty-eight euros,” and bagged his purchase and left. What a city! We walked for what seemed like miles around the Ring, the circular boulevard that marks the location of the old city wall of Vienna, which Franz Josef ordered torn down so that his imperial city could expand. On every corner, there seemed to be a place we’d heard about all our lives: the Sacher Hotel, where the world-famous Sacher torte was created, and which still houses the Café Mozart, where there has been a coffee house since 1794; the Albertini Museum, currently showing an exhibition titled “From Monet to Picasso;” the gorgeous Opera House, home to more than 300 performances per year; the amusement park, the Prater, where the enormous ferris wheel made famous by the movie The Third Man still revolves high over the city, each of its cars capable of carrying 30 people or several horses (so goes the legend). 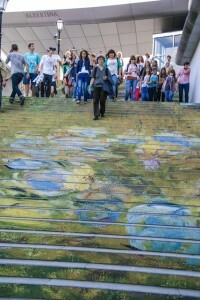 The Albertini seems to treat its fame with a very light touch – the broad flight of stairs leading up to the main door was on this occasion painted on the leading edges to represent a typical Monet of water lilies, especially stunning when gaggles of schoolchildren came streaming down the steps after their tour. Like most of our fellow passengers, we chose to stay in the city after our morning tours and fend for ourselves for lunch. We found an irresistible oasis at Oberlaa, a very good corner restaurant on the Ring, where we managed to squeeze past the obligatory dairy case filled with desserts and chocolates (we later learned that Oberlaa is famous for its chocolates – well, who knew?) to a quiet table near a beautifully-dressed Viennese woman reading her newspaper while waiting for a friend. Our beautiful blonde English-speaking server cheerfully explained the lunch specials, and Gerry simply had to order wiener schnitzel in Wien (the Austrian name for Vienna), while I indulged in my last opportunity for authentic goulash. Everything they say about the food in Vienna is true, and even more so. I don’t think it’s possible to have a bad meal in that city. Despite the fact that the Danube is not and never has been blue, Vienna has the aura of a magical, mystical city where Strauss waltzes are king and the buildings appear to be made of meringue. The Austro-Hungarian Empire may be dead and gone to dust, but Vienna still has the luster of its long and glorious past. Unquestionably unique and truly unforgettable, Vienna is the ageless beauty celebrated in legend, and we loved it. For more images of Vienna, click here. After World War I, the face of Europe changed dramatically, with some countries (like Hungary) being stripped of much of their territory and others (like Slovakia) being forced into unhappy marriages of convenience that suited the powers that emerged victorious from the war. As I mentioned earlier, Yugoslavia was a federation created from Serbia, Croatia, Bosnia, Slovenia, Montenegro, and Macedonia which was never destined to be a successful country. When it came apart in the 1990’s, it was only with much bloodshed and political upheaval. Similarly, Slovakia and the Czech-speaking countries of Bohemia and Moravia were combined into a new state called Czechoslovakia after the first World War, with the capital in Prague and two-thirds of the population Czech, which made for an uneasy alliance, at best. When it, too, came apart, though, it was in what has been called the “velvet divorce,” resulting in the friendly relations that now exist between Slovakia and the Czech Republic. 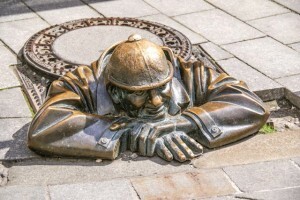 But Slovakia’s long and complicated history may be the main reason for its current buoyant sense of optimism, which certainly seems justified when you visit its lively capital, Bratislava. To get an idea of how complicated that history is, just look at the names by which Bratislava has been known over the centuries. The ancient Greeks knew it simply as Istropolis (“the city on the Danube”). The Romans called it Posonium. The first Slavs, who arrived in the early Middle Ages, called it Brezalauspurc. To the Hungarians it was Pozsony, and to the first Slovaks it was Presporok. The Germans have always called it Pressburg, and the residents who have lived in the city for generations still call themselves Pressburgers. It has been known as Bratislava only since 1920, when it became part of Czechoslovakia. Before 900 AD, the country was ruled by Slav princes, after one of whom, Vlatislav, the city was eventually named. Between the end of Slav rule and the formation of the new country of Czechoslovakia, Hungary was the master of the region. Most of the citizens of Bratislava spoke German or Hungarian by 1920; only one person in seven spoke Slovak. What happened to Czechoslovakia during World War II was in a way inevitable, since it had no strong national identity: in 1938, afraid of invasion and war, the government simply capitulated to the Nazis, and Bohemia and Moravia became protectorates of the Reich. Slovakia did not surrender until a German gunboat steamed down the Danube from Vienna and aimed its guns at the Slovak government building. For the rest of the war, Slovakia was a Nazi puppet state. When the Russian troops arrived on the scene, the era of Czechoslovakia as a Soviet satellite began. At first, the citizens were hopeful that socialism would improve the lot of the country, but over time the more hard-line communist leadership took control. In 1968, Alexander Dubcek, the Czech president, and like-minded reformists began to implement policies that were dramatically opposed to the official Soviet line. In a brutal show of force, Soviet tanks and 200,000 troops entered Czechoslovakia and put an end to what became known as the “Prague Spring.” The following year, the country was divided into the Czech Socialist Republic and the Slovak Socialist Republic, still communist states. But the final chapter wasn’t written until much later. Our onboard guest lecturer for the day, a Slovakian author named Martin Sloboda (who spoke flawless English and looked like a young Charles Dance), described what life in Bratislava was like for four generations of his family during the 20th century. Because of the changing regimes, alliances, and loyalties of the times, sometimes it was good to be Hungarian but bad to be German; then good to be German and bad to be Hungarian; and sometimes worst of all to be Slovak. People were required to describe themselves on their identity papers as either Hungarian, German, or Slovak, which made it easy for whoever was in power at the moment to subjugate one group or another. If you were overheard speaking the “wrong” language on the street, you might be denounced to the authorities, with nasty consequences. Martin’s grandfather, for example, was arrested one night because he designated his ethnicity as Hungarian, and was held in prison for several months, emerging a broken man. His great-grandfather had been a prosperous butcher who kept his savings under the mattress, so to speak, instead of investing in real estate. As a result, after the collapse of communism in 1989, when property that had been confiscated by the state was returned to its former owners, the family had nothing to which it could lay claim. And the money that had been saved so carefully over the years was almost worthless after several successive monetary reforms. But the most interesting part of the story concerned Martin’s father, a brilliant young mathematician, who was invited in the mid-1960’s to go to Washington, DC, to present a paper at a prestigious conference. After much difficulty, he was able to get a visa, but his wife and all of his family had to stay behind as security for his return. He was also warned by the local communist authorities that he should be careful who he spoke to in America, and that he would be expected to report what he’d been asked and by whom when he returned home. As it happened, while he was in the US, he was invited to go to Stanford to work on a NASA project. He said he would love to, but he needed to obtain official permission and a US visa allowing him to work (which he was assured by the US would be no problem), and back to Bratislava he came. This was 1968. He was able to get permission to travel to the US with his wife and baby daughter (Martin’s older sister), so the young family sold their apartment and all their household goods, obtained their plane tickets, and waited for the promised US visas. A week before they were to leave, a phone call came from the US embassy in Prague saying that there would be no visas, because NASA’s funding had been cut and the position he had been offered no longer existed. Three days later, Soviet tanks rolled into Prague and the country’s borders were closed. In 1989, though, came the “velvet revolution.” Hundreds of thousands of young people, mostly high school and university students, marched in peaceful protest in cities all over Czechoslovakia. Government troops, perhaps sensing the inevitable given what was happening to communism throughout Europe, or perhaps just reluctant to fire on their own children, displayed remarkable restraint. Martin was sixteen, and he and his fellow students at the boys’ high school on the banks of the Danube left class every day to join the other 100,000 Bratislava youth, marching and singing the protest songs they’d learned from listening to the Voice of America or Radio Free Europe or from their parents who had been part of the “Prague Spring” uprising of 20 years earlier. Martin said those parents were generally tolerant of the conduct of their offspring, believing that even though they themselves had been unsuccessful in bringing down the regime, their children would finally achieve that goal. And they did. The result was that in 1993, the independent Republic of Slovakia was born, with Bratislava the newest capital city in Europe. The city of Bratislava is charming and colorful, illustrating the resilience of its people even after decades of communist repression. A 16th-century church stands a hundred yards from the spot where one of the city’s three synagogues stood before World War II, and where a poignant Holocaust memorial marks the construction site for a replica of the original synagogue. Attractive young women enjoying the warm, sunny day seemed to be everywhere, and whimsical art punctuated streets and plazas: a bronze Napoleon leaned over a bench to have his picture taken with tourists; a tall statue of Hans Christian Andersen wore a long coat decorated with figures from his most famous stories – “The Emperor’s New Clothes,” “The Ugly Duckling,” and several others; and a comical bronze soldier crawled up out of a manhole on a busy street corner. The landmark castle on the hill above the city was largely destroyed by fire in 1809, when Napoleon’s soldiers billeted there were careless with fire. Although under reconstruction off and on (currently on again), it is not open to visitors. 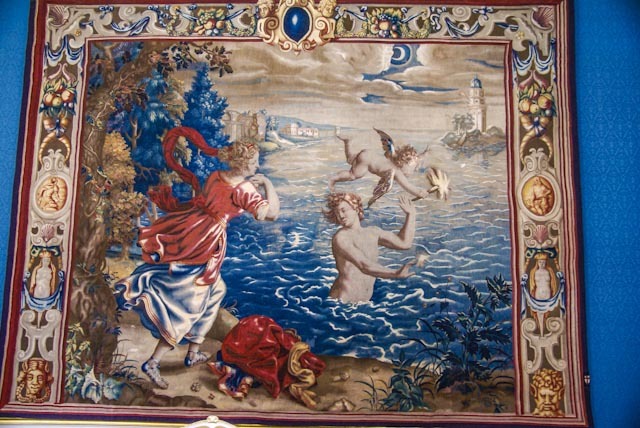 But we were treated instead to a visit to a quite resplendent government palace that is home to a set of six 16th-century “English tapestries” depicting the legend of Hero and Leander, the only complete set known to exist. Astonishingly, the tapestries were discovered rolled up inside a wall when a remodeling project was undertaken a century ago, and no one knows how they got there or who they originally belonged to. The colors are as pure and vivid as they were 500 years ago, and the artistry of the weavers is remarkable for any age. To see more photos from Slovakia, and Bratislava in particular, click here. We crossed the border into Hungary at Mohacs at 4:00 AM on June 4. I can be that precise because at 4:20 AM, we were peacefully sleeping in our comfortable bed when the voice of Marina, our Dutch hotel manager, came over the intercom in our room. Very apologetically, she asked everyone to please present his or her face to the Hungarian immigration authorities at the reception desk — immediately. So we sleepily put on robes and slippers and padded down the passageway to pick up our passports, show our bare faces to a pleasant young woman and a grumpy young man in Hungarian uniform, and obtain a stamp in our passports allowing us to continue up the Danube. 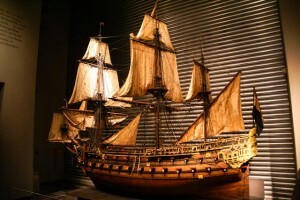 Apparently, the crew never knows whether or not the local authorities will require us to make a personal appearance, but we always sail overnight in order to keep to our schedule, so middle-of-the-night arousals might occur without notice. The scenery continues to change as we move west and north. Along the lower reaches of the river, the land is level or gently rolling, and the river is thickly bordered with trees, mainly deciduous. Very little evidence of human habitation is seen near the river, only the occasional small village or town, and there are no roads or highways directly on the water. As you sail to the west and north, more hills and cliffs appear, and the towns and cities come along more frequently, some with signs of industrial development. As we discussed with some of our fellow passengers, it’s good that we took the westbound rather than the eastbound itinerary, as we are moving from the less developed (and perhaps less westernized) part of the world to the more sophisticated regions from Budapest and Vienna to Amsterdam. We were able to look at Romania and Bulgaria and Serbia and Croatia with fresh eyes and without making any unfavorable comparisons with more highly developed countries. Our first port in Hungary was Kalocsa, which isn’t actually on the river any more, since the Danube has gradually shifted its course away from the town. But Kalocsa is a quiet, charming village in the heart of the paprika growing country, with a lovely Baroque cathedral and a fabulous library (housed in the archbishop’s palace), as well as the world’s only paprika museum. The library, which dates back to the early middle ages, contains more than 150,000 volumes, most of them bound in dark leather trimmed with gold, as well as a Gutenberg Bible, beautifully illuminated medieval manuscripts, a Bible that belonged to Martin Luther, and one of the four existing copies of the 11th century crown of St. Stephen, the first king of Hungary. In a little gift shop across from the cathedral, two women shopkeepers displayed intricately embroidered clothing, tablecloths, and table runners, most in bright floral patterns. 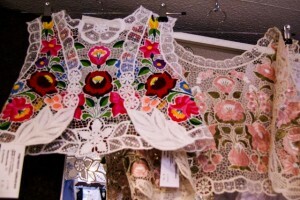 One typical type of work is done on wide mesh lace, and the flowers appear the same on the reverse of the fabric as on the front. As everyone marveled at the skill of the embroiderers, the two shopkeepers confessed that they had done all the work by hand, using a treadle. 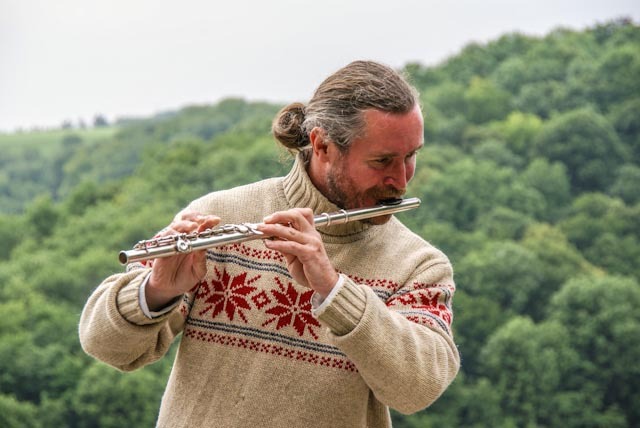 One of the features of a Tauck tour is the occasional private performance or event exclusively for us. Here in Kalocsa, we were treated to a superb pipe organ concert in the lovely village church, where the sun, filtered through stained glass windows, bathed the sanctuary in soft golden light. But the first thing everyone thinks of when you say “Hungary” is of course Budapest. 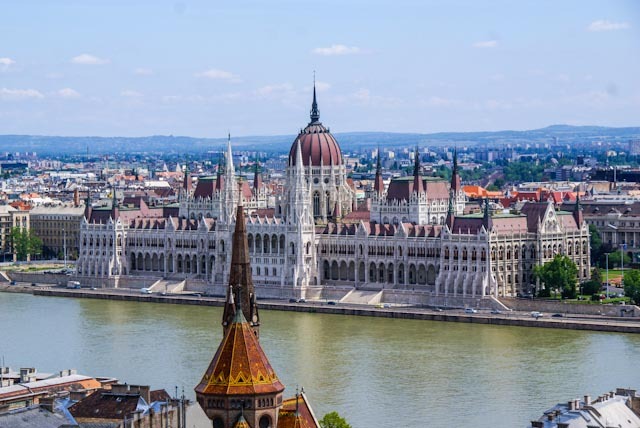 Nestled on both sides of the Danube, this loveliest of cities was originally three towns: Buda, Old Buda, and Pest (pronounced “Pesht” in Hungarian), united as one city only in 1873. Buda is set high on rocky hills, while Pest is, as they say, as flat as Kansas. The city lies above a vast thermal lake, resulting in more than a hundred thermal and mineral springs and giving rise to Budapest’s reputation as a spa city. 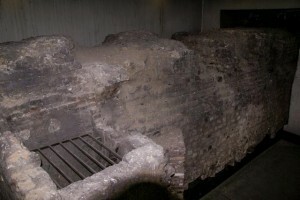 Some of the baths date back to the 15th century and the era of Turkish occupation. 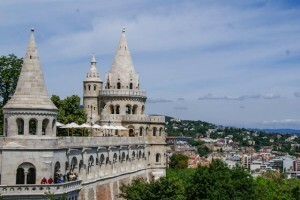 Budapest has been occupied by foreigners almost continuously since the 9th century, which gives it a sort of cheerful resilience and the ability to absorb the best of all the cultures that have passed through it. The first conquerors were the Magyars in 896, followed by Attila and his Mongol hordes in the 13thcentury. The Turks arrived in 1541 and stayed for 150 years, until the Austrian Habsburgs defeated them, eventually resulting in the formation of the Austro-Hungarian Empire. At the end of World War I, the Empire collapsed, and Hungary (having been on the wrong side) lost two-thirds of its territory. After World War II, Hungary (on the wrong side once again) came under Soviet control and only gained its independence when worldwide communism began to unravel in the late 1980’s. But during the days of Habsburg rule, many of the buildings that give Budapest its unique character were constructed: the stunning Parliament building that stretches along the river like a fairytale castle, with turrets and columns and spires all crowned by a huge green-roofed dome; the perfect jewel box Opera House, which Emperor Franz Josef permitted to be constructed as long as it was smaller than the one in Vienna; the Royal Palace on Castle Hill, planned by Empress Maria Theresa in grand style, with a thousand rooms so that each of her sixteen children could have his or her own suite and servants; a still-operating funicular up the steep cliff from the river to the top of Castle Hill; and Fisherman’s Bastion, high above the river, with seven whimsical towers shaped like upside-down ice cream cones – actually meant to look like the conical roofs of Hungarian peasants’ huts – representing the seven Magyar tribes. 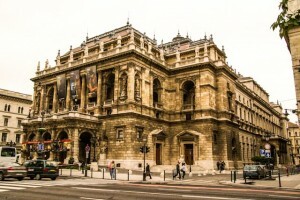 The Opera House, with its col;umns and wide staircases and elegant “cafeterias,” where the wealthy and cultured residents of Budapest drank and gossipped during the four or five (!!) long intermissions, is as beautiful as it is impressive. We were treated to a performance of opera arias by two professional singers on the landing of one of the marble staircases, as if we were attending a special musical event in the 1890’s as guests of the Emperor. 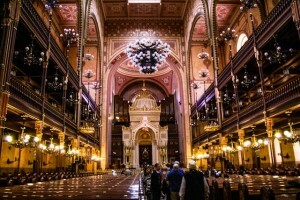 But perhaps the most impressive building in Budapest is its great synagogue, the largest in Europe and the second-largest in the world, the largest being in New York City. Built in the late 1800’s of warm red and yellow brick, it stands in what was the Jewish quarter of the city before World War II. Inside, it is laid out somewhat like a Catholic church, with two pulpits and a pipe organ, which isn’t surprising since the architect was Christian. Its majestic proportions and the fact that it still stands at all are amazing. During World War II, the synagogue was used as a German command headquarters, with a yellow cross painted on the roof to tell the Nazi bombers that it was in effect a German building. When the Germans abandoned Budapest toward the end of the war, they took everything of value from the synagogue, but they left the yellow cross on the roof. So the building was bombed by British, American, and other Allied planes in error. It has only been reopened to the public, following its restoration, since shortly after the turn of the 21stcentury, but many of its original treasures survived the war and are back in place. 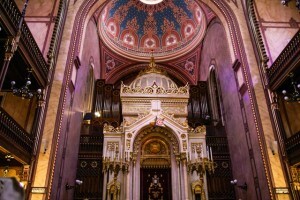 All the stained glass windows were removed before the Nazis took control of Budapest, as were the synagogue’s seventeen Torahs; all of these priceless things, together with anything else that could be hidden, were wrapped and buried in sand underneath the Hungarian National Museum, where they remained until it was safe to bring them out of hiding. In the garden of the synagogue, there is a stainless steel sculpture that at first looks like a grove of weeping willows. On closer inspection, though, the trunks and limbs represent the branches of a menorah, and the leaves are individually inscribed with the names of Hungarian victims of the Holocaust. It is an intensely moving reminder of what happened in Europe in those terrible years. Many prominent Jews from around the world contributed funds for the restoration of the synagogue, most notably Tony Curtis, born Bernard Schwartz to Hungarian Jewish immigrants in New York. This was his favorite charitable project, and he was extremely generous with his support for its rebirth. Until the Nazis arrived, the Jews of Budapest had lived fairly normal lives under Swiss, Swedish, or Vatican protection. But after 1944, all the Jews were forced into a ghetto surrounding the synagogue, where many died of hunger and disease. Since the Jews in the ghetto could no longer reach their traditional cemetery, those who died during the Nazi occupation were buried in mass graves just outside the synagogue. Later, after the war, family members had small memorials stones laid on the site to commemorate their dead. Only about 200 stones rest in the graveyard; it is estimated that more than 2500 Jews are buried there, never identified. Worst of all, though, were the actions of the fascist gangs of the Hungarian Arrow Cross party, the Nyilas: hundreds of Jewish men, women, and children were marched to the bank of the Danube in the bitter cold, where they were forced to undress and were tied together in threes. One of the victims was killed with a single bullet, causing all three to fall into the river and drown. The most poignant memorial in Budapest is a line of metal shoes, large and small, fixed to the Danube embankment, memorializing the Jewish victims of the fascists. One particular hero came out of the persecution of the Hungarian Jews: Raoul Wallenberg, a Swedish national attached to the Swiss foreign office, saved untold numbers of Jews by giving them Swedish papers and hiding them in safe houses until they could escape or until the war was over. Our guide at the synagogue, a Budapest-born, Brooklyn-raised Jewish man named Reuben, said that Wallenburg socialized with Adolph Eichmann in Budapest in order to persuade the Nazi to let him carry out his rescue efforts. After the Soviet invasion in 1945, Wallenberg was arrested by the Russians and charged with espionage; he disappeared into a Siberian gulag and was never heard from again. There is a memorial to him in the garden of the synagogue, as well as another in a public park. On a more cheerful note, we visited – twice – the famous Central Market Hall, built in Art Nouveau style in the 1890’s and still in daily use by locals and tourists alike. 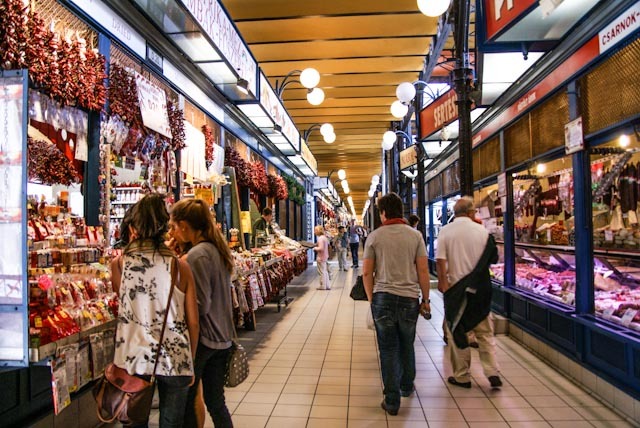 The ground floor is packed with individual stalls selling fresh vegetables and fruits, paprika in all its incarnations, jams and honey and fruit brandy, acres of Hungarian sausages, dried mushrooms, and incredibly beautiful pastries. Upstairs are tiny food vendors’ stands, selling salads and goulash and sandwiches and soups of every description, all smelling wonderful; as well as handmade embroidered clothing and tablecloths, leather gloves trimmed with fur, beautiful china and pottery, and a dizzying array of souvenirs like nesting wooden dolls, metal key rings, soccer uniforms, T-shirts, tote bags, perfume, and small wooden puzzle boxes that lock with a hidden key. I can’t leave this country, though, without a comment about the Hungarian language. One well-known scientist said, “I believe in extraterrestrials. In fact, I’ve met some of them. They are Hungarians.” Hungarian is almost impossible for a non-native to learn to speak. It isn’t related to any other language, not even Finnish, although I’ve heard that comparison. Its letters are neither fish nor fowl, neither Latin nor Cyrillic, and consequently its signage is incomprehensible. Even if we could read the letters, the words bear no resemblance to words in any other known language. In my opinion, instead of using Navajo code talkers in World War II to confound the enemy, the US Army could have hired Hungarians. We loved Budapest and would have been glad to spend more than two days discovering its secrets. We think it’s the most beautiful city we’ve ever seen (admittedly, we’ve never been to Prague, which claims the title according to many people), and despite its size, it seems to embrace the traveler with warm and welcoming arms. 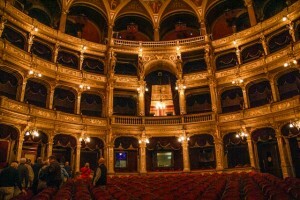 To see a photo gallery of Budapest scenes, click here.